Houston Texas Stop Over, What to do? Never have I had such trouble deciding what picture to post to represent the area I visited. The thing about Houston was, I got off the plane, asked the lady at the Houston information counter, "Where would you take a house a guest that is visiting you for two days?" The response was, somewhere other then Houston. I was a bit surprised, explained I had two full days and two part days to spend in the area and wanted to take some pictures and get a feel for Houston, TX. She gave me the brochure and other then suggesting The Galleria (shopping mall), she felt I might, with my photographer's eye see something interesting or appealing that was not appealing to her. She suggested Galveston historical area might be nice but the beach was ugly and other then that, there just isn't a lot to see in Houston. After 4 days in Houston, I do not totally agree with her but I will say, there is not a lot to see in Houston, and nothing really sums it up in a picture. Anyone I spoke with who lived in Houston, did so for work, and wished they could live where they were from. They find the city puts on events and can find lots to do, but there is nothing (no water front, no mountains, no interesting forests. no great cycling trails), just office buildings and refineries (which are amazing to see on their own for the sheer size and the lights at night, wish I'd had a chance to go in one and get some photos of these). In the end, I decided it was definitely not an area I would head to for a vacation, but an area that one could make the best of if they had to land there for something. This is not to say I did not enjoy my time in Houston, I certainly did. I always make the best of where I land. So, I went to the Galleria for the morning of day 1 where I found the airport lady had neglected to mention they have an indoor skating rink with rental skates. That was the best part of my entire trip. I spent 30 or 40 minutes skating in Houston. 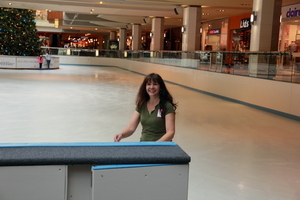 I'm quite sure most people do not want or need to go to Houston to skate but it was sure fun. Also, while in the Galleria I visited one of my favourite stores, Swarovski Crystal, where I found what I want for Christmas (hint, hint, maybe this year hints will work), and the young lady, Jennifer Ziman, at the store gave us all sorts of things we could go see while in the area. 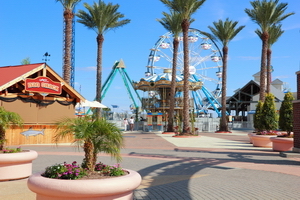 So we set up a plan to see the Keemah Boardwalk and Galveston for the afternoon. She also suggested the Red Dress Museum (first ladies of the US wax museum), Nasa, and a few other areas. What a wonderful girl who I'm sure will do very well in her career managing stores for Swarovski. Jennifer also gave us her cell number incase we got lost on route to any of the destinations she recommended. With a plan in our hands we set off from "The Galleria" toward Keemah, on route to Galveston, about a two hour drive. Jennifer believed we would pass by Nasa on the way to Keemah but that didn't happen, so we never saw Nasa (another time if I'm ever stuck in the area), but we found Keemah.The rides were all up and running midweek on the Tuesday and there was side walk restaurants where you could sit out on the board walk, watch the water and enjoy a meal with friends. I wasn't very hungry yet, I had pumpkin pie for breakfast at the bakery we found in "The Galleria". Oh, look for the bakery downstairs if you happen to be there. The baked goods and coffee we enjoyed for breakfast were terrific and the rest of the food going out to tables looked fabulous. The Boardwalk was quite small, but quaint with rides and shopping, sitting right on Galveston Bay, and well worth a stop and walk.We did a short walk and continued our drive to Galveston, mostly along the Galveston Bay coast line. Let me start of with the short but sweet, we were not impressed with the food here. We came upon this small boardwalk with a few restaurants as we neared Galveston and decided to stop for a fresh seafood lunch. 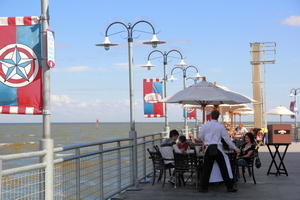 We stopped at the Fisherman's Wharf, part of the Landry's Restaurant chain. Neither Robin nor I were particularly hungry yet (Robin had picked up a nasty cold on the flight in), so we ordered a light lunch type meal. I had a cup of clam chowder and a fresh cat fish Po Boy (well that's what I asked for), and Robin ordered the clam chowder and a crab cake.We had coffee and water to drink. The clam chowder was excellent. The coffee was not fresh. The Po Boy came on a hamburger bun, not a calabrese bun I would have expected to see a Po Boy sandwich on.The cat fish was many small crunchy deep fried pieces stacked on this dry bun that fell out as I was eating it and really the sandwich did not impress at all. It was dry and not fresh and the cat fish was okay but I will have it try it somewhere else to see if I actually like it as I had never had it before and don't trust it was truly fresh fish either, judging by the rest of the order. 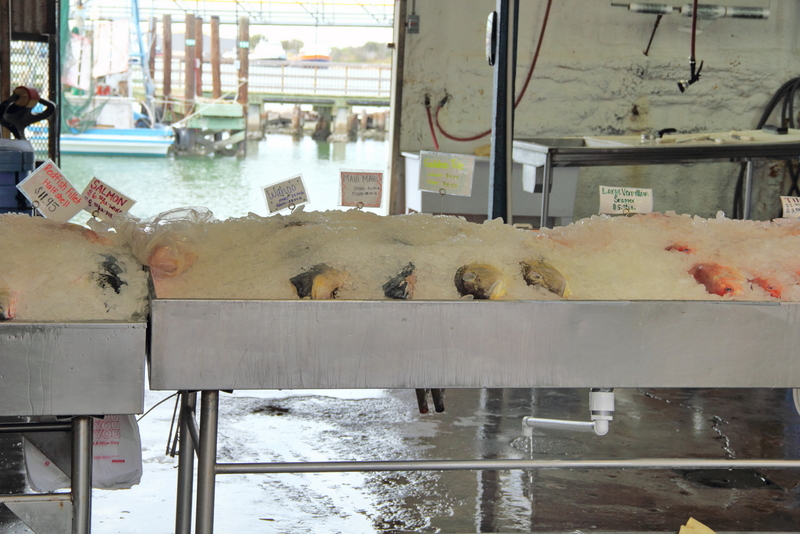 Robin was not impressed with his order, other then the chowder, which was excellent. We both wished we had just ordered a large bowl of chowder with a slice of bread to dip. The meal, though very small and no drink came to $51.00 without the tip.Very expensive lunch for what it was, and the Fisherman's Wharf is not a recommended stop. There was a couple of other restaurants right on the same piece of board walk; I would try one of them first. Eating lunch at one of the restaurants did gain you a parking credit which is $6.00/hour up to $18.00 max if you just park to look around. We specifically stopped to eat so if had not been free parking we would have just continued, as we probably should have. The sites along the wharf and across from it were not exactly pretty but very interesting. 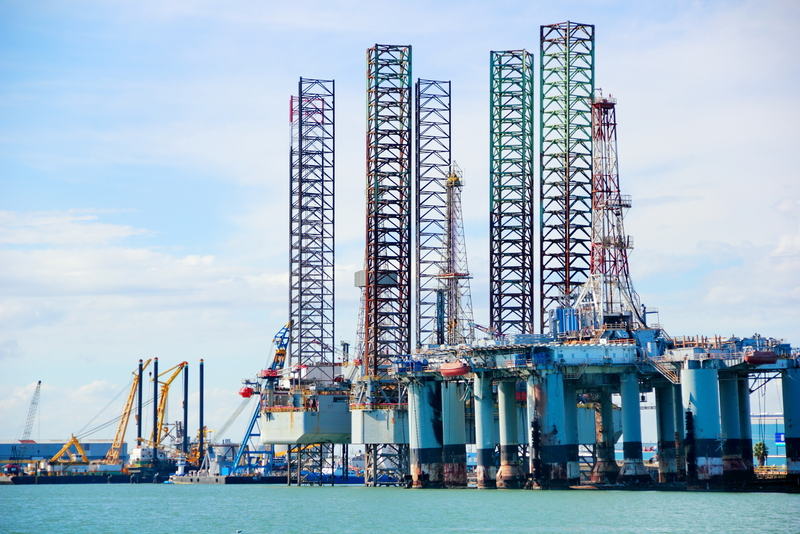 There was this rig directly across from our outdoor table, either being readied to be hauled out to the gulf for service on in dry dock for repairs were my guesses. 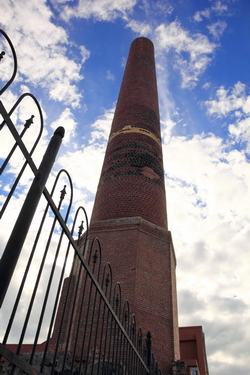 The industrialization of the Galveston area was evident everywhere. 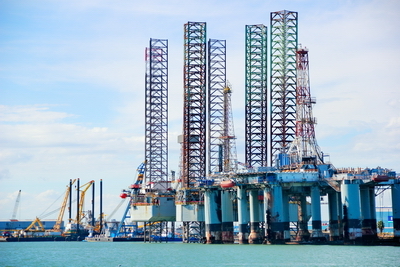 Views of rigs and oil drilling equipment along the shores of the bay, to this falling down stack in town, just across from Pier 21 to Pier 19 where there was also fish markets to buy fresh caught seafood. 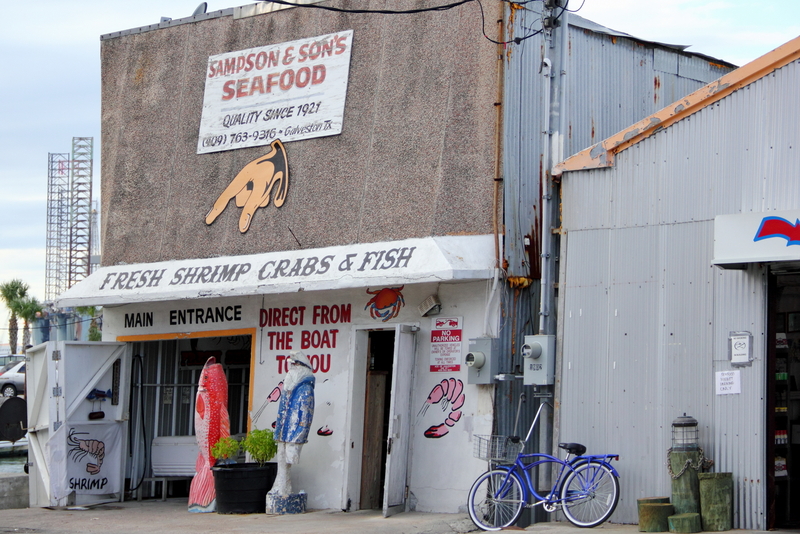 We stopped at some fresh sea food shops and I sure wished I was somewhere I could cook me up a seafood feast tonight,but the hotel room microwave wasn't going to suffice for that, so I just settled for the picture of Sampson and Son's and Katie's Seafood Market along with its wares. 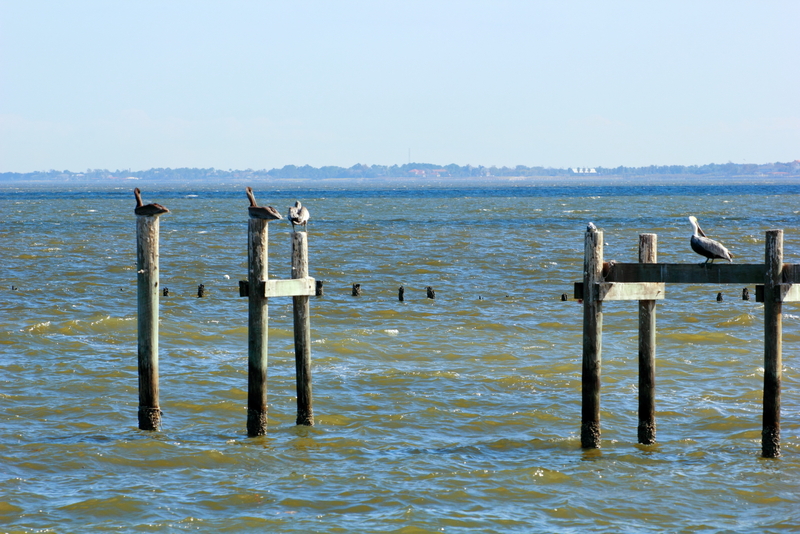 A fellow invited me through to take some photos of the brown pelicans out back. He threw them fish so they would all come close for me. That was hospitality. The pelicans and flowers and sea food could endear me to the area if I let it, but really it's not enough to draw me back for an extended stay.The apparent clash of nature and industry was never so obvious to me as in this area, photographing the pelicans while trying to keep rigs and scaffolding out of the photo.As we explored Galveston we noticed the free ferry and decided that a drive up the Bolivar Peninsula to circle back to Houston was the perfect way to complete our day. 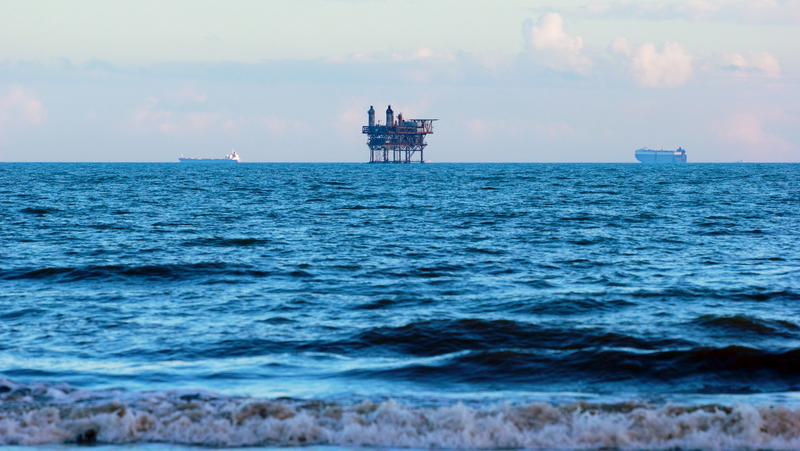 After disembarking from the Galveston Ferry, we stopped a little beach along the Bolivar Peninsula as the sun was beginning to set to take a couple pictures of the off shore oil rigs I could see in the distance. 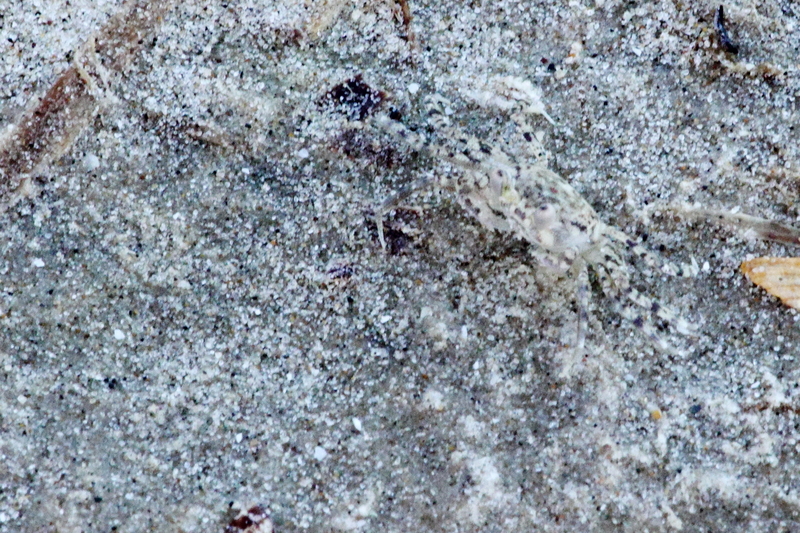 While on the beach we spotted this tiny sand crab, I have the photo here; have fun spotting out his eyes and legs in it. He is the exact colour of the sand. If it had not been for him scurrying along I doubt Robin would have spotted him and pointed him out to me. Just one of the cool things we found in the area. The sea side has its own charm, maybe not the beautiful but certainly interesting. I thoroughly enjoyed my drive and headed back to Houston as it was getting dark. I'll upload a Houston and area photo album, give the idea of just what is here. 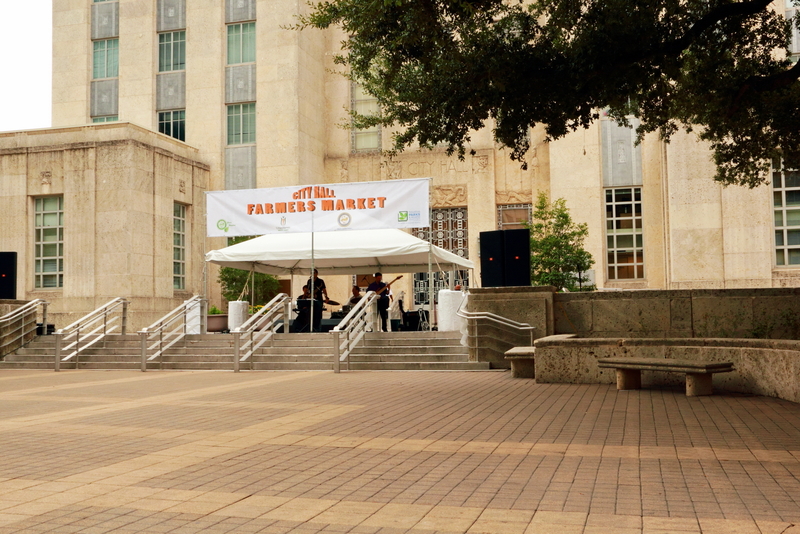 Well for Day 2 in Houston, it didn't seem right to head out of town again so we thought we would head in to town and check out down town. We followed the highway signs and arrived downtown Houston bright and early. It took very little time, 10 minutes, from our hotel by car. Speaking a young lawyer who had relocated to Houston from Austin (he misses Austin), to take a job working for the Houston Government, he says, pretty much anywhere you live in Houston will have you down town in 10 minutes. Strangely Robin and I had already noted that Houston seemed to be mass of criss crossing roads. The young lawyer tells me that the road system is so good that they have little need of transit and the public transit is awful. 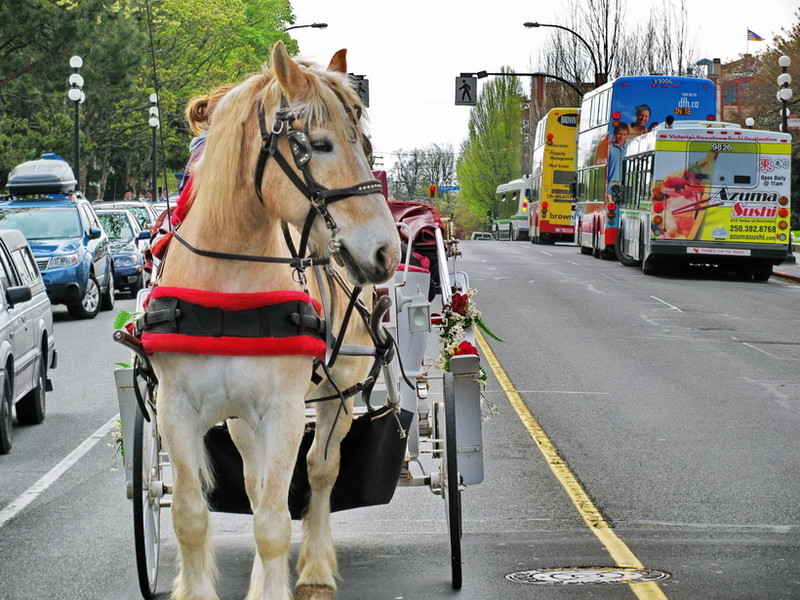 They are not very green and everyone wants their own car, as this is the promoted means of transportation. He does say it looks like a long awaited enhancement to the public transit may finally make it through council and get upgrade approval this year for a 2011 start. Again, the question, where would you take a house guest that comes to visit you brought the strange answer, "to Austin, they have little eateries and walk ways and it's beautiful, you should go there". So another Houston resident sending me out of town. 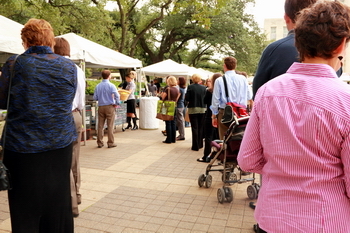 He did say that Houston always has stuff going on for evenings, and things like the Farmer's Market where we were both patiently waiting 40 minutes for the VERY popular crepes from Melange Creperie, that everyone was lined up to wait for. I lined up to wait, just to see what everyone felt it was worth waiting their entire lunch break to get. My young lawyer friend; well he felt like a friend as we chatted for most of our 40 minutes waiting ( I actually waited 1 hour and 15 minutes total), tells me that the crepes are very popular all over right now and that in Austin they make them much faster and this fellow is new. He will have a very limited income at the speed he makes his crepes until he learns to multi task a little better and whip them together a little faster. Personally they were okay, but I wouldn't spend my lunch waiting for the ham, egg and cheese crepe I chose to have. It was quality ham, nice cheddar and the crepe was cooked well. It was just too long of a wait. 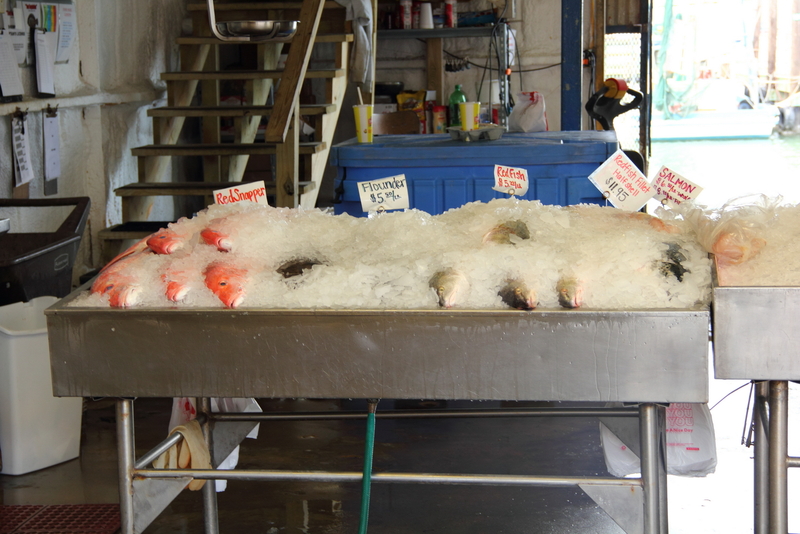 There was many other options at the market and I wished I had the time and appetite to try more. The danish Robin and I split from the organic bakery was delicious; fresh berries, a nice custard and perfectly cooked. 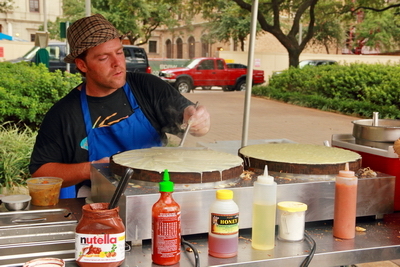 The most popular crepe seemed to be the banana and nutella with a whipped cream topping. Maybe this was the one that everyone felt was worth lining up for. 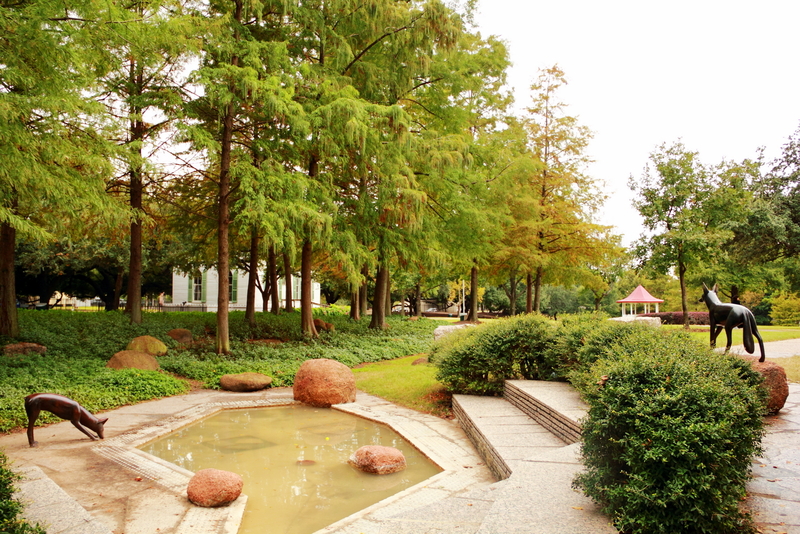 Along with the Farmer's market we found a some nice city park green spaces between the tall sky rises of the Houston skyline and a very large park where Houston brings in homes and buildings of historical value and sets them up on the grounds for viewing and tours. This is run by the Historical Society of Houston and a very interesting park to walk around. 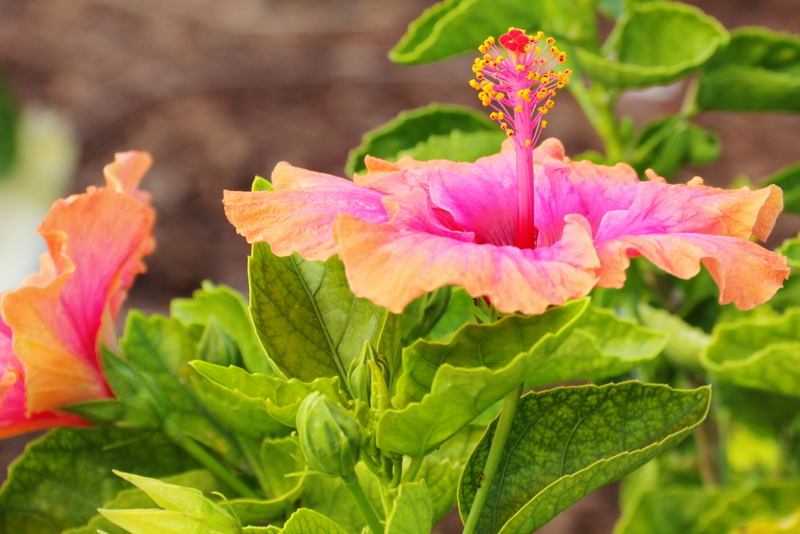 As you walk around, each house or building has a phone number you can call for further information, along with a nice park of green space and acreage. Live chickens run around between the buildings and each building is entirely different from the previous. 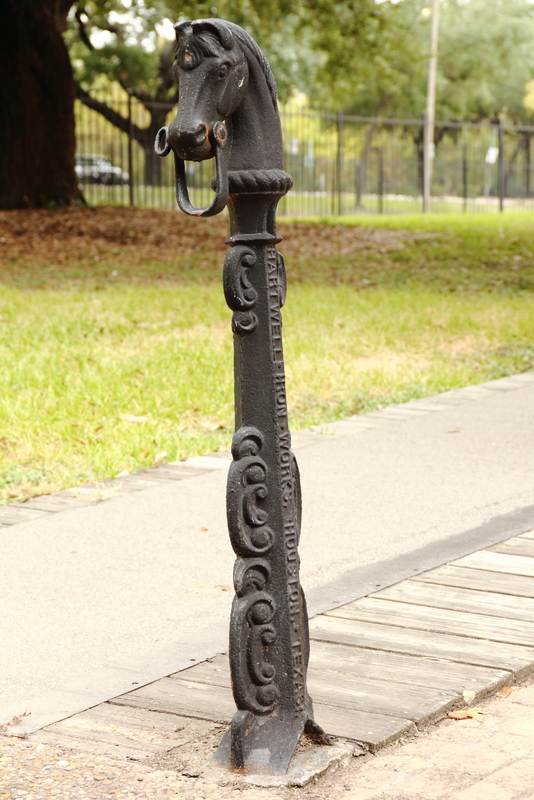 These horse ties ups was authentic, made in Houston, but the Hartwell Iron Works. A nice spot to find in the middle of a city. It was beginning to look like rain while we walked around this park so Robin and I decided to boot it back toward where we parked. Good thing we headed back when we did as it started to pour on our way back. We had almost made it to the garage when it really started coming down and managed to stay relatively dry hopping from awning to awning and then making a dash across one road to our parking garage. 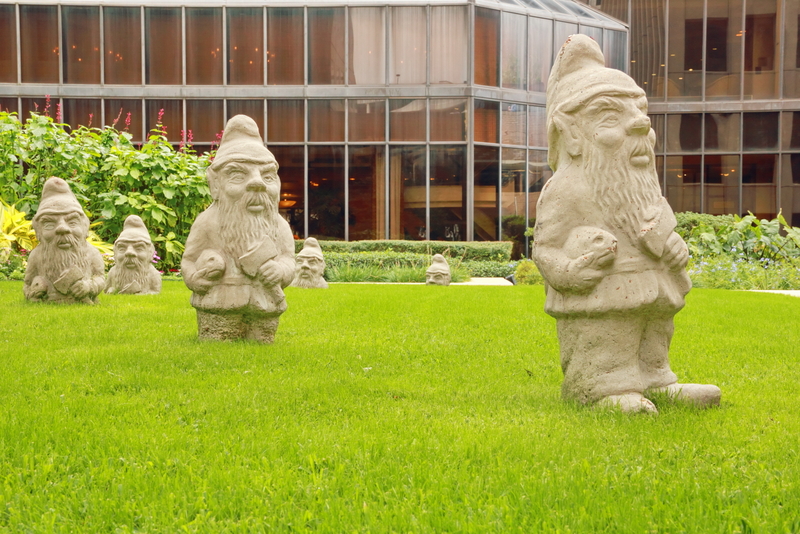 The gnomes in my photo here I couldn't resist. Is it not like a gnome coming out party? 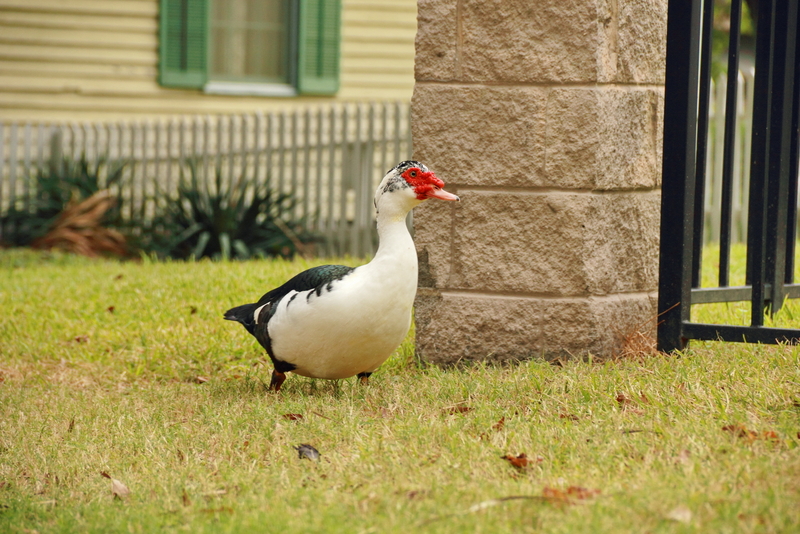 They were in one of the many green spaces between buildings. The other photos are from the historical park. I could have spent more time there if the weather had cooperated. The chickens running around the park added a unique flavour to the middle of the city scape and I wanted time to phone and hear about the homes. A tour would have been nice, but we didn't time that quite right. So here it is, why not, another slide show with scenes from the tip to Keemah, the Galveston harbour and the city. Hope you enjoy the write up. Just remember, unless you are heading to Houston for something specific or doing a short trip in to say, "I've seen it", it really did not have enough going for it to warrant a week's vacation. So two weeks ago it was off to Mebane, NC for a few days to spend some time with Robin before I head off to Canada to work for the winter. Yes, I'm heading up home or not home, or who know's where I live again. 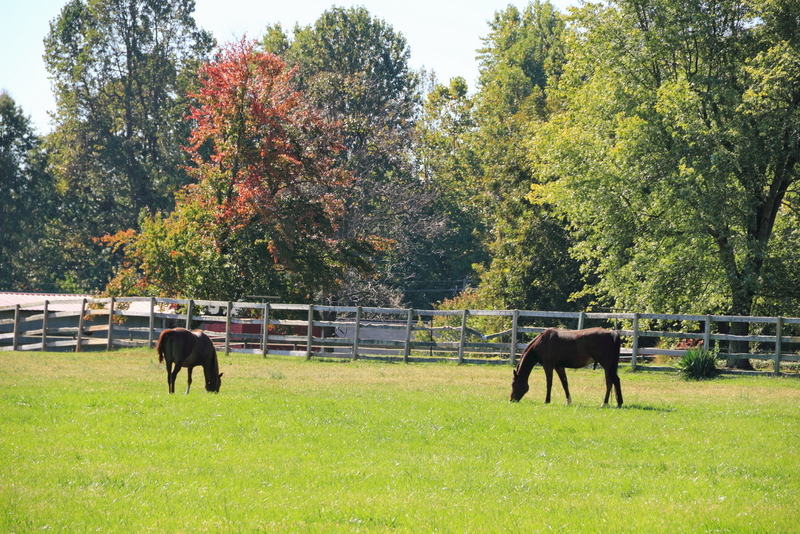 Mebane was a pretty tiny town with not much to see, other then some fall colours as we drove north, the hotel court yard and a little farm I took a couple horse pictures. 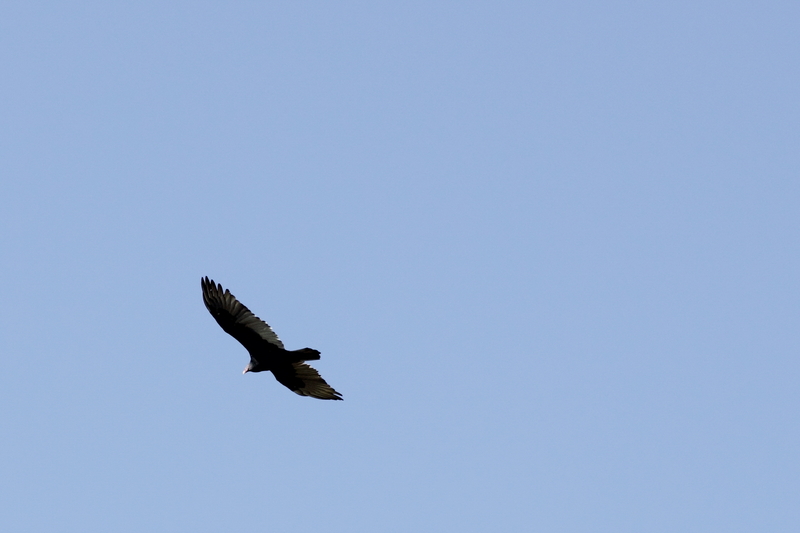 Oh yes, and a shot of an eagle flying over head. 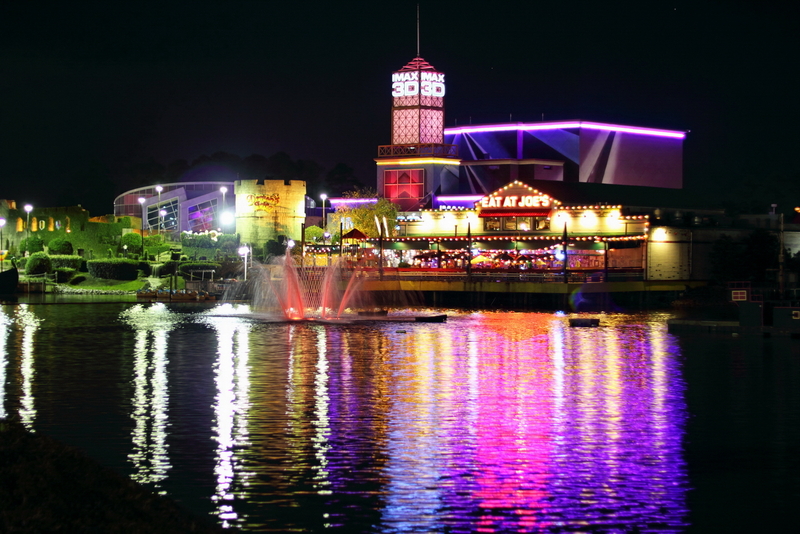 When we left Mebane on the Friday it seemed like a good idea to take the scenic drive home, spend a night in Myrtle Beach on the way and just see what was new. 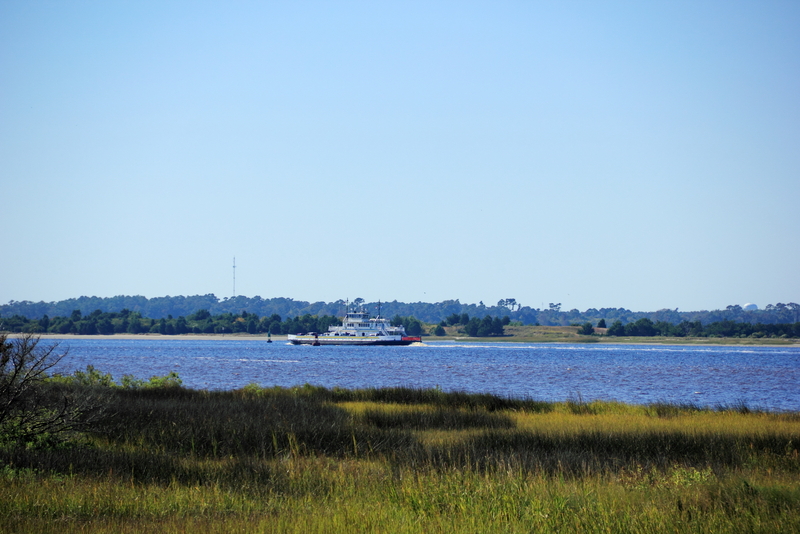 Our drive took us down to the Fort Fisher Ferry Port. 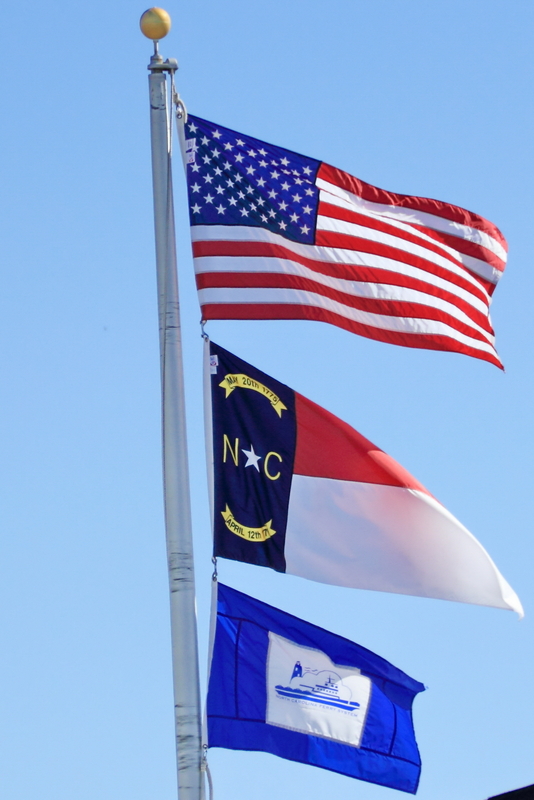 The North Carolina Ferry Commission runs numerous ferries on the east coast to connect Islands and peninsulas where they haven't put in roads. Hatteras being one of the larger and Fort Fisher to South Port being a pleasant half hour Ferry through the protected waters of this Inner Atlantic Ocean inlet off Long Bay where many the Carolina's Beaches are(Holden Beach, Caswell Beach, Long Beach, Ocean Isle Beach, NC, and North Myrtle, Myrtle Beach, Surfside Beach, SC to name a few). 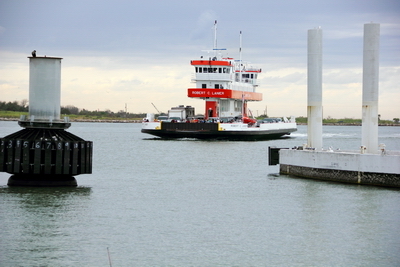 The roads and ferries weave in and out along a coastline of peninsulas and islands. All a very pretty drive but you want to have no time schedules as with ferry waits and drives in and out of the coast you aren't getting any where fast. 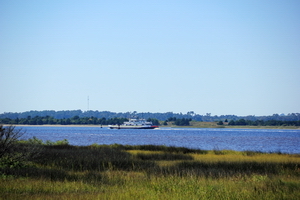 We arrived at Fort Fisher just as the Ferry was pulling away from the Fort Fisher Ferry port and heading to South Port, NC. No worry, we had lots of time and nothing on the schedule so waiting 30 min for the returning ferry was no big deal and gave us time to have a stretch and enjoy the seaside park at the dock and take pictures. The North Carolina Ferry system runs two ferries here, back and fourth, so there is a ferry leaving every 45 minutes to take you across a 30 minute ferry ride (15 minutes to load and unload cars). The total cost to put the car on the ferry and ourselves was $5.00. Great deal, worth taking just for the sight seeing trip. You can view old buildings and light house bases along the ocean side, or wild life and pleasure craft you encounter along route. 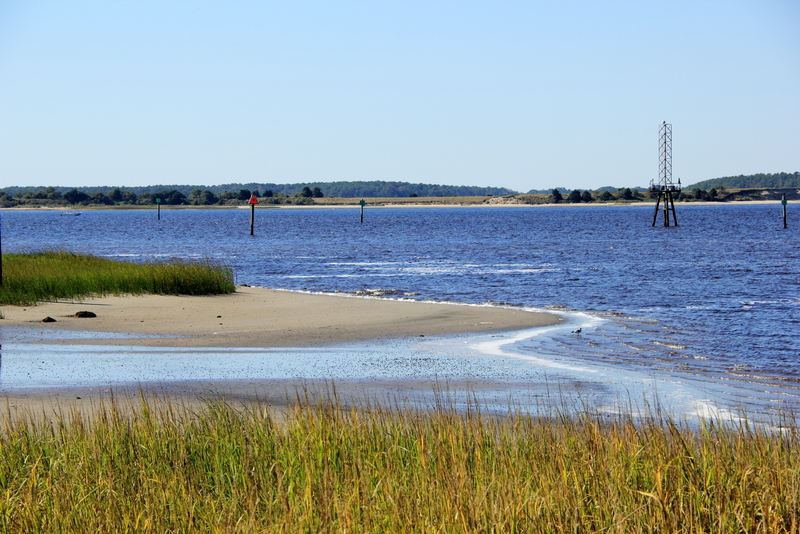 Once we reached South Port we headed out to Hwy 17 to continue the trip to Myrtle Beach. As we reached Myrtle Beach we pulled in to a Dunkin Donuts, logged on to the free wifi and booked a 4 star room at Hotwire.com. We found a 4 star room this way for $65.00 at the Sheridan Inn between the beach and Broadway at the Beach. Friday evening we went up and did a little souvenir shopping (Christmas shopping for the nieces, nephews and grandchildren), and had pizza from one of the restaurants at Broadway on the Beach. We watched salt water taffy being made and purchased a little too. I took a few evening shots of the lights along the Broadway at the Beach board walk, and walked back the hotel room for an early night to spend the morning at the Beach. Don't forget Hotwire.com if you are looking for a room. Anything 3 star plus will put you in a Holiday Inn plus type hotel and get you a great price. We could have spent 39.00 to 50.00 for a room or condo along the beach in the 3 star category. Our room at the Sheridan was anywhere from $123.00 to $169.00 at other online sites, the difference being, you know what you are booking there. I'm always up for an adventure, so knowing I trust their 3 star plus rating system, I'm happy to take the low price and then see where I'll be staying. Myrtle Beach has been given a face lift this summer by the town. 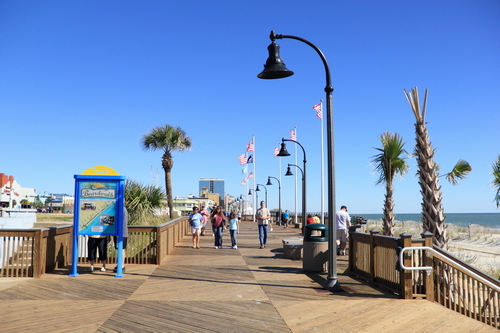 The town of Myrtle Beach promised the people, hotels and stores that when they cancelled bike week in 2008 they would invest money in a board walk and beach face lift to attract more families and visitors of a non destructive nature to the area. They have now completed a two mile walk way, consisting of a board walk and concrete walking path. I don't know if they plan to extend it beyond two miles but it was certainly getting used while we were here on the Saturday. They do allow bicycles and pets on the walk way after labour day but prior to labour day and after May 31 each year bicycles and pets are limited to 7 to 10 am each day. I am surprised they didn't take the time to put in a secondary path for cyclists, roller bladers, skateboarders, etc like most beaches do today to accommodate the healthy life style many now enjoy. Cycling has seen a huge a resurgence in the past few years and is not expected to die off any time soon. Most towns are scrambling to accommodate bicycles and their use somehow. Myrtle Beach seems to have lost it's opportunity to be on the ground floor and not have to look for space later. Well this is the town that gave away 500,000 bike week visitors for unknown reasons also and left the near by beaches scrambling to attract them and their money. 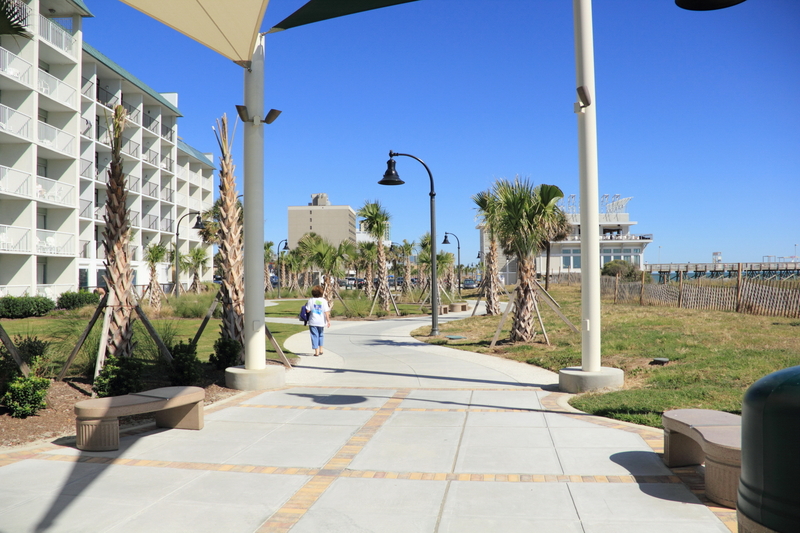 The Board Walk is very Virginia Beach style, minus the extra path or divider for wheels, and looks like it will be wonderful when it all matures. I have photos below in the slide show. 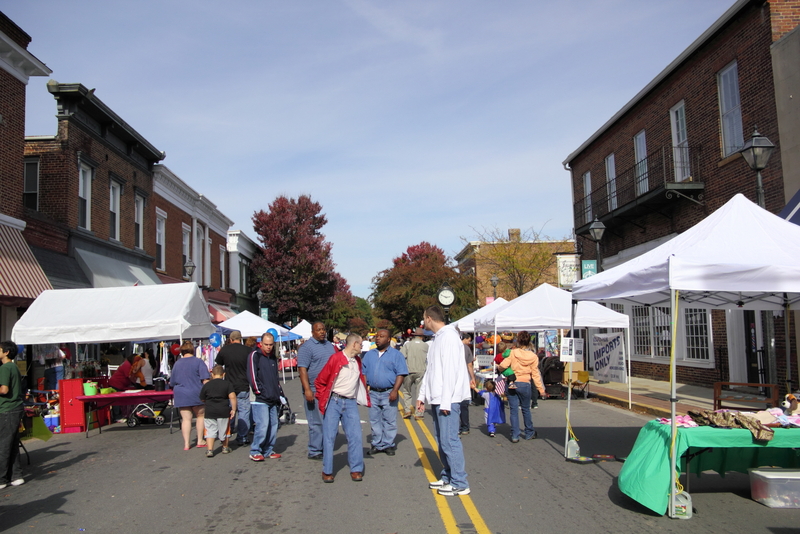 Every tiny small town in the south puts on some kind of Fall Festival for its residents and York is no exception. 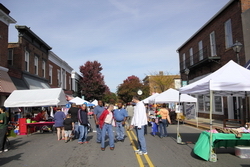 The whole town comes out to see who's who, get dressed up in their Halloween haunts and browse the day away at the craft vendors and displays. An added touch to this years festival was the Car Show going on as part of the festival. Lots of interesting old cars to be seen; it is a real hobby of choice down here in the South where old car bodies lay in fields and never rust away, just waiting for someone to come and restore them to their former glory. I found one I just loved, maybe more then one, but this Studebaker was my star. The car show had me entertaining the possibility of a new hobby. It might be fun to take and redo a car from shell to it's former glory. The festival was much larger then the last one I had gone to in town. There was exhibits of working antique farm equipment, town's people selling their hand made wears, and a surprisingly good band that Robin and I stopped and listened to for quiet a while. While listening to the band the well dressed Sara Palin (or is it her?) came over to hand us a bag of very southern boiled peanuts. Boiled peanuts are everywhere down here, a very interesting local favourite. I love the taste but I can't quite get used to the mushy pea texture. I did discover one more tidbit of Southern lore when viewing one of the nice old homes for sale. Porch ceilings are painted blue to keep away the Mud Dabbers nests (a very large form of non stinging wasp down here). There was people running around town with their families all dressed up and kids in their costumes and everyone was having fun.We had a really good day at the festival; met some fine people and chatted lots while checking out everything the festival had to offer. I even found myself that perfect necklace and earring set, compliments of Stacie Morrison Sloan (on facebook, no web site), to go with the dress I picked up on my last cruise. I've been looking for one since December. Stacie had some awesome pieces to offer at great prices. I'll be checking her out on facebook. We grabbed lunch downtown at the Train Station restaurant, where they make their own burgers and the best steaks in town ( I know it's small but they are really good), and we ended the day just before the 6pm judging at the car show. I have no idea what car won, the Studebaker was my winner though. Well the rest of the photos and fun can be found in the slide show right here. Enjoy the tour. Some time ago, 6 months I guess, I went off for a little vacation to visit my brother who moved out to Victoria, BC in October of last year, after a short stint in Inuvik. It is now on the top of my list to return and see more. 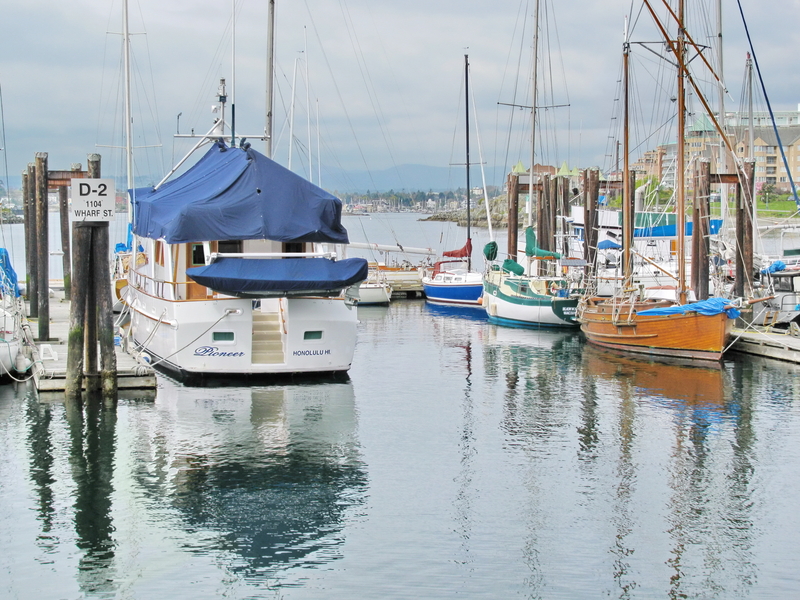 He didn't quite move to Victoria, he moved to a little suburb of Victoria; Saanich, BC. There's a terrific transit system that gives access to Victoria on a regular schedule all days of the week via the transit system. 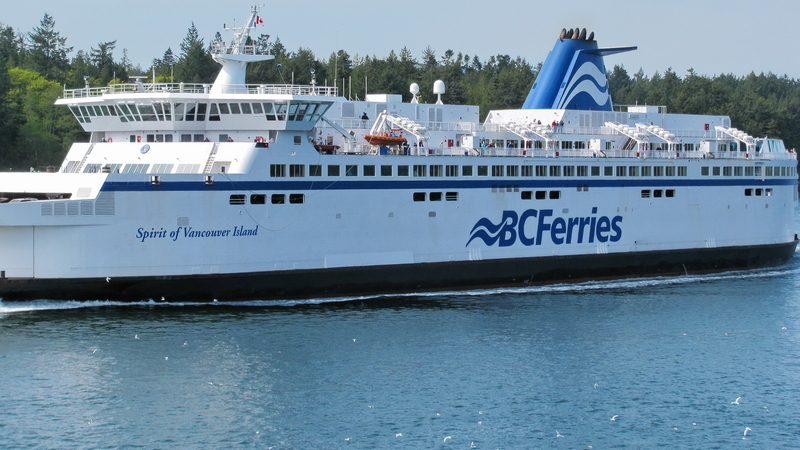 The BC ferries take you back and fourth to the Vancouver's mainland at regular intervals each day, rarely falling behind schedule and you can check on line to verify up to the minute updates on how the schedule is looking. His apartment is around the corner from Brentwood Bay, but I didn't get time to take that ferry, I just took the big one, Tsawwassen to Swartz Bay, which is a beautiful ride across; worth the cost just to do the ride. The area around his house has wonderful little parks and nature trails with the incredible mountain scenery and wild life it takes a special place to find. I can't wait to return and see more of the Island. I have lots of pictures of what I did see, including whale watching on the last day of my holiday. I fit in a round of golf at his local course. 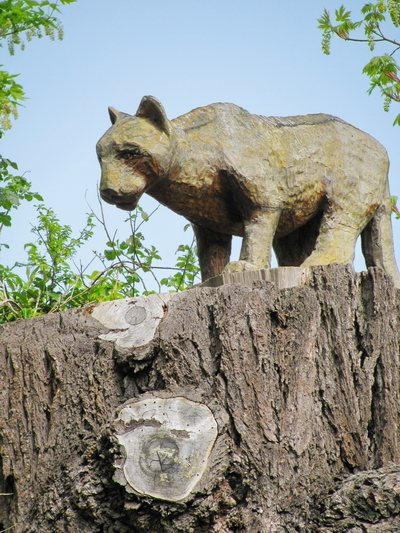 Pretty little course, with this surprise carved out of one of the trees on the course. I actually took the ferry with my brother who I had met in Vancouver to head skiing at Whistler for the weekend before going to the Island for a week of sight seeing and a visit. Whistler, BC was incredible and far exceeded my expectations, especially for the conditions in mid April. It was my first time to Whistler and the village accommodation, stores, restaurants were all wonderful. 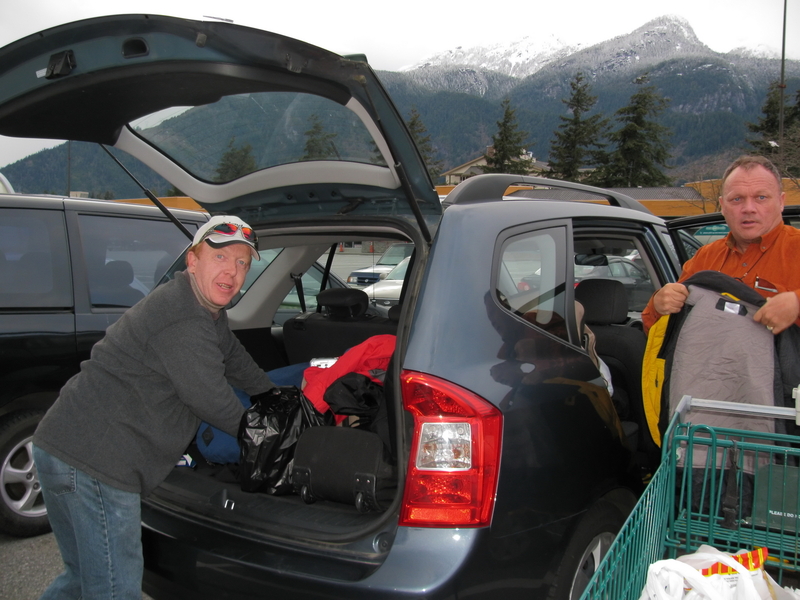 We rented a condo and bought groceries on the route up, so I can't speak for the cost of food at the resort but it was reasonable by Canadian standards (costly compared to the US), in Squamish, the town prior to reaching Whistler. The terrain at Whistler was unlimited, tons of all types from beginner to expert, and all of us, including Peter, who is a beginner found terrain we could manage and enjoyed the resort. The scenery is definitely up there with the best you can find. Be sure to check out all the photos in the Whistler photo album, if you haven't already. 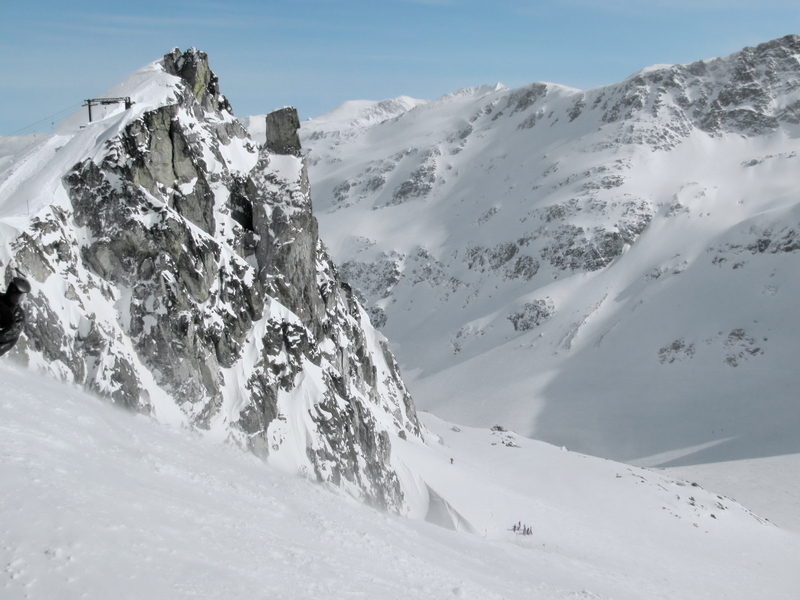 Definitely put Whistler on your list if you are a skier. It is a must go to resort and make sure you get the Blackcomb Whistler, Peak to Peak ticket so you can enjoy the glass bottom gondola and all the terrain the mountains have to offer. After reaching my brothers for the week I started sight seeing the night I arrived. If the sights on the ferry hadn't been enough to see there's a little nature park near his house we went to for a walk just as the sun was setting. I was busy taking a pictures of some shrubbery when a young British boy fishing near buy shouted over to me "Right Maam, are ye getting photographs of the eagles there?". I said, "What? 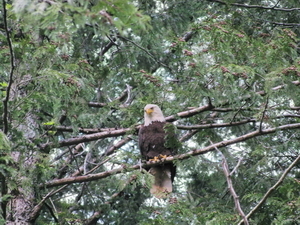 ", and he repeated "Are you photographing the eagles there maam?". 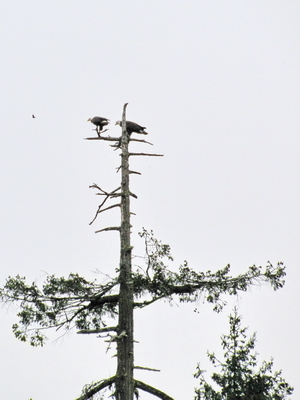 Wow right above me was two eagles. Of course, when I turned my camera I managed only one very poor quality photo before they noticed they were being watched and flew off, but a little later I did get a grainy photo of another as it was starting to get dark. I'll have to return with my new camera and a telephoto lens. I sure wish I had my new camera when I was there, the picture opportunities were incredible. 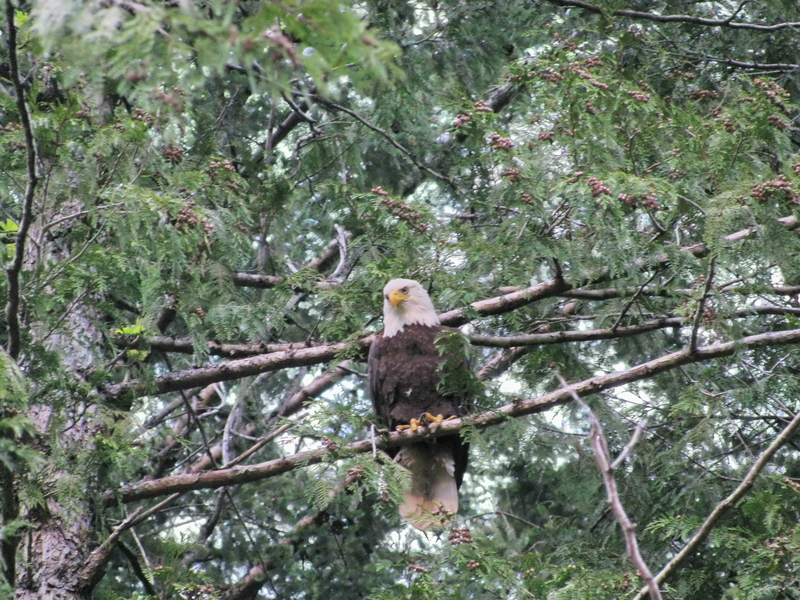 The young British fellow caught a fish as I stood watching the eagles and I wish I had taken his photo for him. He didn't wash his hands until his Maam arrived so he could let her know he had indeed, caught a fish. 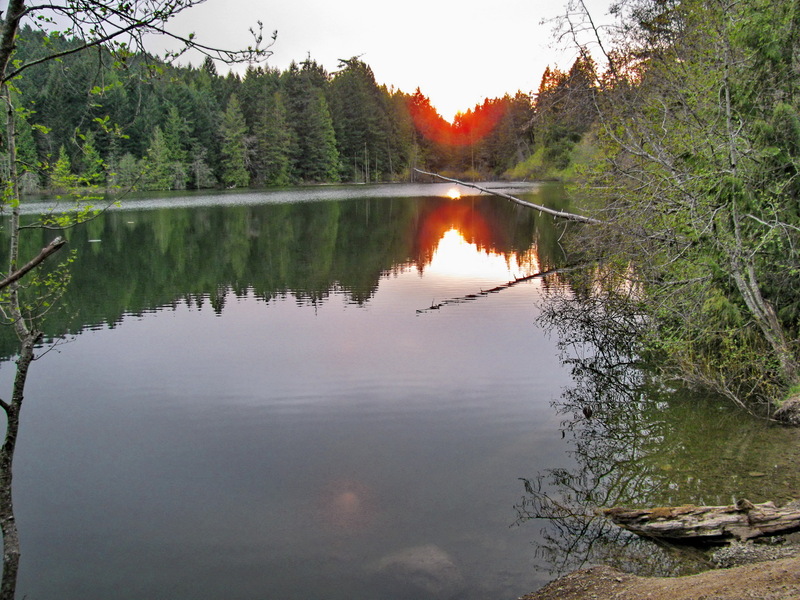 I left his treasure of a park to head up a near by road that went along the Straight of Georgia (Pacific Ocean between Vancouver and the Island), where I was awed by the views of the ocean, the distant snow capped mountains and the general nature all around. To live on the Island is to learn what it is to be green. 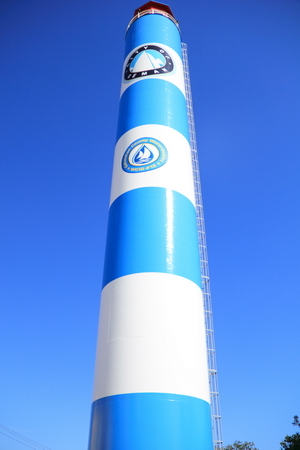 Reduce, recycle and reuse are ways of life here. There is not even garbage pick up at my brother's house unless you pay an independent contractor to do the pick up, so he just makes as little as possible and takes a small grocery bag full of garbage to his work each week to get rid of. Over the next couple days I went to Sydney, BC to see the wonderful sea side park and Marina, Beacon Park, filled with local artist sculptures commissioned and placed there by the town, got downtown Victoria a couple of times and booked to go Whale Watching on the Friday before leaving. I really wanted to get to Nanaimo but just couldn't find the time. A return trip to see it all is a must. Maybe this year I'll get up to Mount Washington on the Island to ski. Don't miss all the photos in the Whistler, Victoria, Whale watching photo album and I'm compiling a few of Victoria right here in a slide show. What a fabulous vacation. 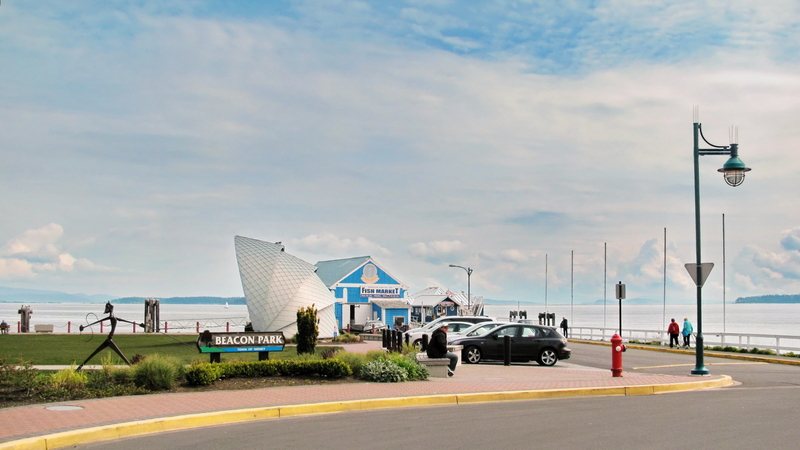 One more must have, the fish and chips at the downtown marina. There's a line up for this treat if you're not waiting for the stand to open at 11am. Well worth the wait. These were by far, the best fish and chips I've eaten, they even beat out the fish and chips I had in Scotland when I was 16. My mom has got to go here and try these (being Scottish it's her favorite meal). Until I can get back and see more, here's a slide show of some of the fun. After a crazy time trying to fly out of Charlotte, NC on United Airlines we finally made it to Salt Lake City, Utah (full photo album here). The night we were leaving was the first of several eastern snow storms about to move in to the North and South East. Charlotte had very light snow falling around 5 pm. Our plane should have taken off at 4pm but had a computer malfunction. After a few hours of trying to repair and waiting a part being flown in, United flew us to Washington, DC (farther away from Utah), to try to get us a flight to Denver that night and then on to Salt Lake City the next morning, instead of our intended arrival on the Friday night. Charlotte was trying to hard to get us out on the Friday before the storm hit the next morning and created weather problems. Well air traffic being what it is, we slept at the Washington airport, with no food even (no where was open at 1 am), and flew out at 9am the next morning to Denver then Salt Lake. Arriving, January 31, 2010, 26 hours after entering airport security in Charlotte, instead of on the Friday. So we missed one day skiing, no problem, we got there, alive and well, I'll have much more to say about United Airlines in Features when I get it written up, along with video taken of how helpful (not) the staff was in Washington. Fly someone else if you have an option. Luck or timing, or the time change would have it, that Robin and I are the first skis in the rack at Solitude Mountain, Utah. 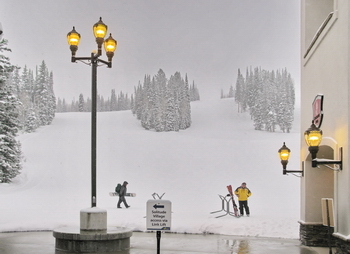 The 12" of snow that had been falling and would continue to accumulate promised a good day to come. It was looking like the big mountain experience of Utah lore was going to come our way. This in spite of a year where the annual snow fall was only about half its 500". We were meeting up with 42 bears. Yes, that's bears, "Epic Bears". We all belong to the Epic Ski Forms. The mountain was only 20 minutes from our Home Wood Suites in Midvale, Utah (little suburb of SLC). 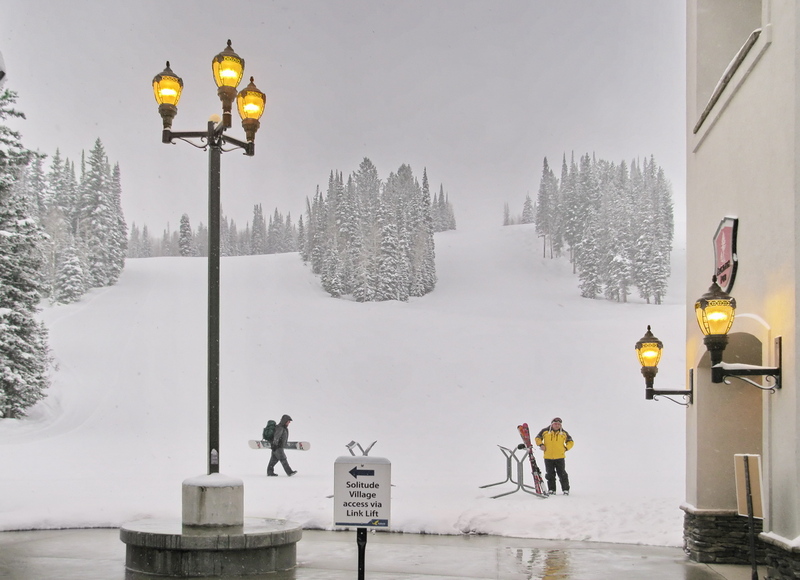 Have to say, one of the really nice things about the Utah ski vacation was how close the hills all were to town. Stay and eat in town, visiting 4 resorts in 7 days was no issue at all. 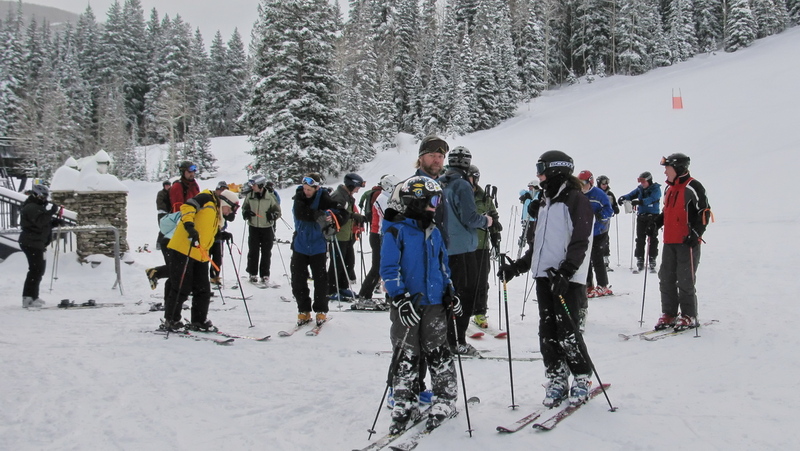 Most of the bears showed up at the 8:30am boot up in the lodge or made the ski racks for first lift at 8:45am. We were off and skiing. Solitude had all the varied terrain you could want. Lots of steeps, stashes of powder in trees, bowls to find, and groomers for those that wish. Robin unfortunately had his bike accident injury flare up and only lasted 2 runs in the deep snow. I'd be without him for quite a few days this week now. Good thing we were skiing with the bears, easy to find with our dangling red and orange ribbons. Matt would drive me to Solitude tomorrow morning and Robin would meet up with us for the planned dinner and the movie "The Edge of Never" being presented by Bill Kerig himself, at Snowbird Summit room, tomorrow night. 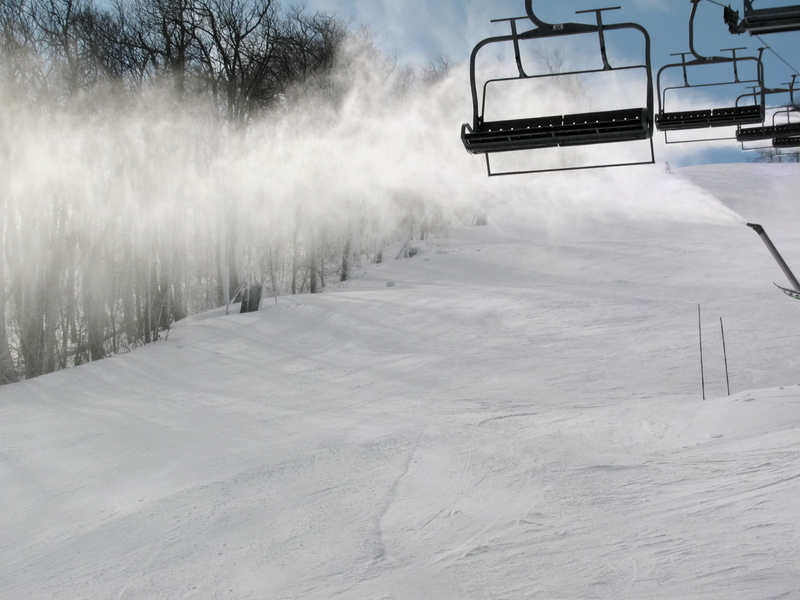 Bill would also be out to show us all the stashes at the Snowbird tomorrow morning, 8:45am. What an honour to meet and ski with such a figure. Great to be a bear. Thanks Tom, for arranging this. Food at Solitude was expensive and the usual ski lodge fair. A bowl of soup for lunch $9.00. Maybe bring your thermos. Good skiing though and great snow. Snowbird is pretty exceptional, not just in the skiing they offer but in the service they gave us bears at the hill. With 3200 vertical feet and 2500 ski able acres, within 30 minutes of the airport, this is a mountain to find a local guide if you can. Snowbird is so large, without a local guide you’re bound to miss the hidden tree stashes and lines you can climb to if you just know where to get to them. A local guide will know the avalanche prone areas along with the current prevalent conditions. When we bears (Epic Bears, from Epicski.com) went we had arranged with a local to spend a morning with us on the hill. I unfortunately missed the meet up time on that morning and had to find my way around via another route. A quick view of the trail map will show you a nice top to bottom intermediate run, Chip’s Run, which goes from the top of the tram to the main base village where you load the tram (picture above). I started off on this run to give me an overview of the area. I quickly noticed I could duck down from one level of the traverse to the next through trees, powder stashes and bump runs dropping directly down to the same Chip’s Run traverse underneath where I popped off the run above. This on and off the groomed terrain in pieces was fun and a great warm up and predictor of what you will find at Snowbird. 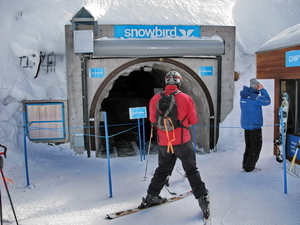 Snowbird has lots of little hidden off-piste areas that cut off and back on to the groomers. At the end of my warm up run I really wanted to know more about the mountain and went looking to see if Snowbird offered any mountain tours. Well right there at the base when I came round from the big bridge that heads into the main base there was tour guides in bright green jackets waiting to take out anyone with a yearning to know a little more about the mountain. I was paired up with Lindsey, a great guy and I highly recommend the tour just to get your bearings on this big mountain and know where you might want to go. He wasn't allowed to take me off trail anywhere but sincerely asked me back next year (when his knee was fully recovered from a replacement operation), and he promises to show me all the lines, not just point from the groomers. It was a good way to start the day. Lindsey took me up the Peruvian Chair lift to the 14 million dollar tunnel (see pictures below) through the mountain. 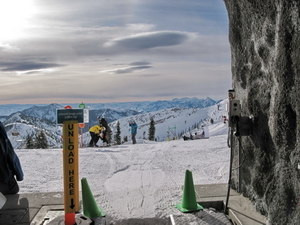 This was built to alleviate the long line ups for the tram by giving access to the back side (Mineral Basin), without needing to take the tram. On the way up the chair he pointed off to the left where the cliff aerial competitions are held each spring and explained a few lines I might want to try. Not something I would try on my own; I wasn't going to do anything quite so adventurous. Lindsey pointed out many off-piste areas in the Basin that I might want to go find and gave me a good general feel of where I could go and what I could do. What a treat. In the great weather we were having (40F and sunshine), I must say I enjoyed the chair ride instead of feeling like a sardine in the tram. The tram would gain a whole new respect from me on a cold windy day though. 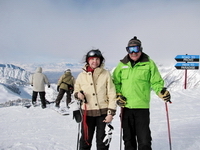 I was happy to hear Lindsey and another tour guide go on about my great skiing and ask to follow me. Good ego boost after feeling a little inadequate on the big unknown hills with all the deep snow instead of eastern ice. I was also on new wider skis. They turned out great. 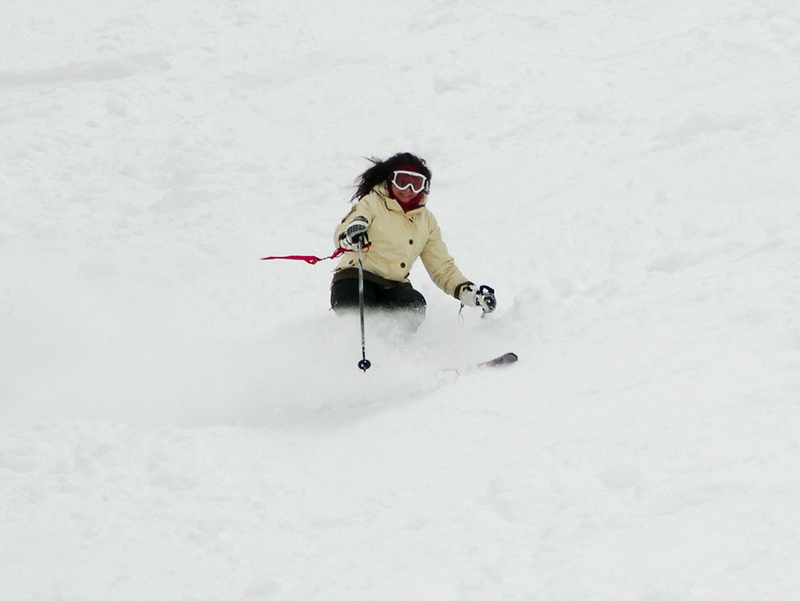 I remembered how to ski real snow. Lunch at Snowbird was the usual ski fare. They have 15 resort restaurants to choose from but I only sampled two. I was meeting the bears at the main lodge and the weather was terrific so we actually ate outside at village picnic tables. I had a pulled pork sandwich and water, plenty adequate but I didn't see any great deals for costs. Bring your own if you need to keep costs down or are looking for specialty diet foods. They won't be easy to find or request here. For Dinner we ate at The Aerie Restaurant in the Cliff Lodge which had specialty pizza�s that were reasonably priced and quite good. They also had a full wine list and fabulous servers. I did take note that the service in The Aerie was as good as it gets. Nice view of the hill also from this 10th floor restaurant. For the afternoon I was off to the Tiger Tail and Thunder Bowl area with a few bears; a traverse into the trees and small bowls, with no groomed areas in site off to the far right looking up at the mountain. This area is serviced by the Gadzooks and Gad 3 lift, or take the tram, ski down to the Gad 3 lift and up from there. Find the Trail Map here. I landed in one tree well but survived.... and had some great fun in the deep wet snow. Do take time to look up the dangers of tree wells. I learned they're real.It was not exactly a BC powder day but certainly deep soft snow, not the eastern ice I was accustomed to. Bumps were perfect with firm but soft forgiving snow to cut around in. One day wasn't enough, nor was two, to explore the full mountain terrain. 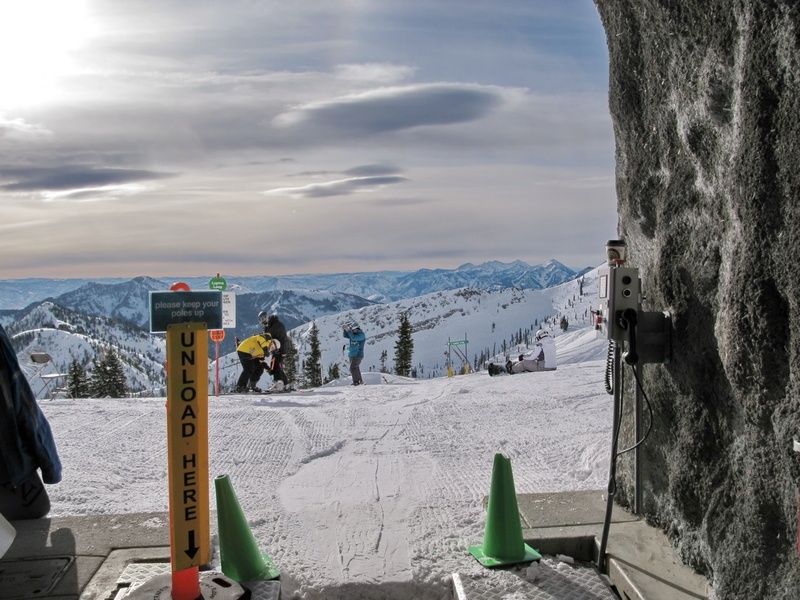 Along with the Tiger Tail area there is the many areas off the back Mineral Basin where a small hike or traverse from a groomed trail takes you to so many hidden ski able tree areas, bowls and little open fields that finding them in a couple days just wasn�t possible. 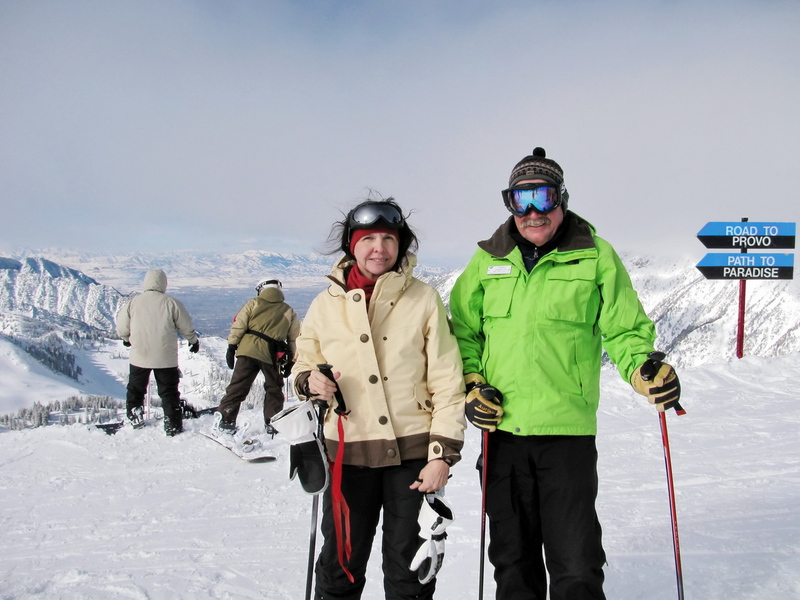 There was many easier areas that my injured husband (Robin) could ski on while I ducked out to a little more challenging terrain, and then back to meet up with him. I finished up the day with another bump run and headed over to the Cliff Lodge to have dinner and meet Bill Kerig. Don't forget to check out any photos that may have been taken of you during the day. The on hill photographers will tell you what roll number to check for at the days end so you may purchase any great shots they got of you. 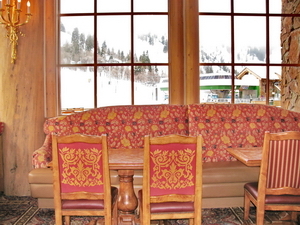 Snowbird gave the use of the Summit Room in the Cliff Lodge to the bears to view our movie and have our meet up. 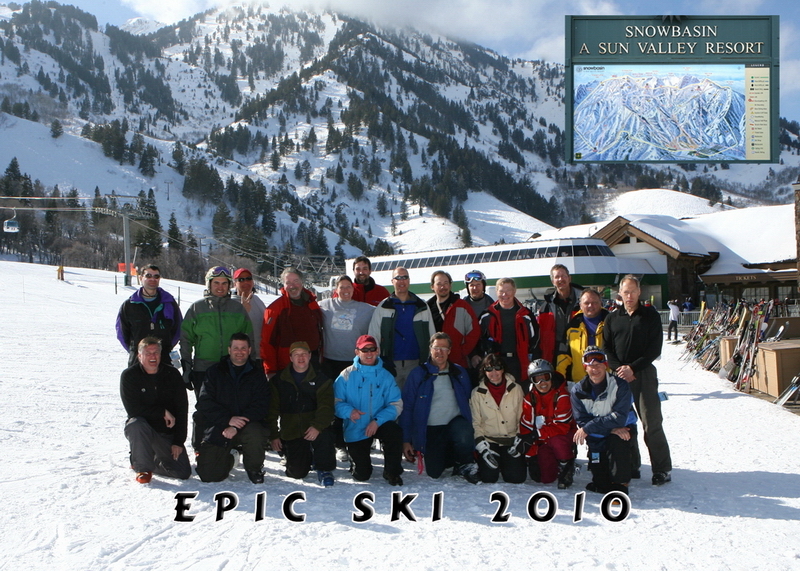 They became sponsors of the Epic Ski Family and showed us support in a big way. Two thumbs up to Snowbird for great mountain terrain and great service. 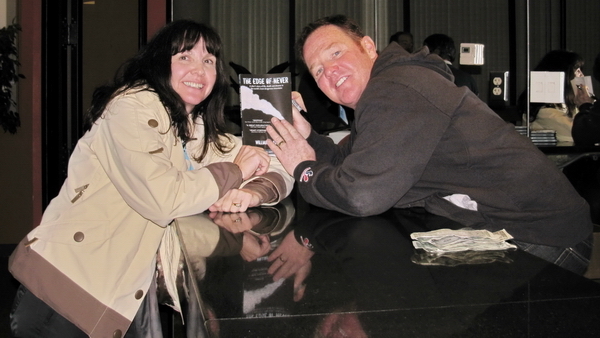 Bill Kerig is the author of the book, "The Edge of Never" and movie, same name. Bill plays in the big leagues. He's a big mountain skier with a passion for skiing that he wanted to make a movie about. A movie that would get to the heart and soul of skiing as he feels it, not another jump and wow ski flick, but a movie that would convey the feeling and passion of skiers. A past US Team mogul skier, friend of Trevor Pertersen (died on a run at Chamonix, France), and friend to Glen Plake and many other big mountain skiers he had a story to tell. It's a story he wanted to convey to the viewer a passion for skiing, not just for big mountain skiers, but how every skier that has the desire to head to the hill the next time it snows, feels. A story that says I do this because I love it, and here's how much. The movie is well worth the view time whether you are skier or not. If you're a mother who doesn't ski, you may not understand the passion that allowed Trevor Pertersen's wife to let Bill take her 15 year old son Kye to Chamonix to make the same run that killed her husband. If you ever had a passion for anything and look at the way Kye skis and into the eyes of boy who lost his dad young, you just might get it. This movie takes you there. Past the skiing and into a story of passion and the completion. Completing what you set out to do. See the movie. It was recently purchased by SHOe and has many repeat viewings for the next month. Take time to see it if you can. Okay, this place is so worth going to see. This was luxury and gourmet meals at a Ski Lodge. There was nothing wrong with Alta, it was a great place to ski, but Snow Basin left me so much to talk about that I just have to feature it. 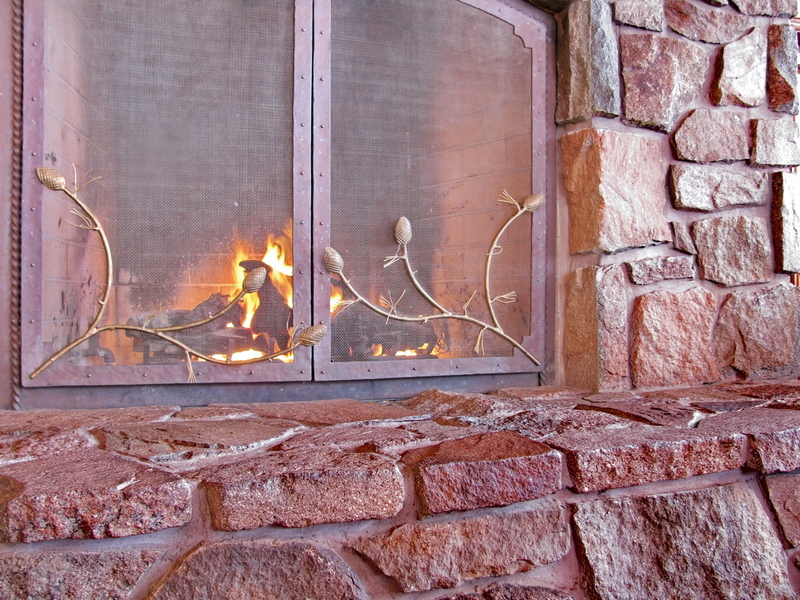 From the huge log and stone ski lodge that greets you when you pull in the parking lot, to the sheer luxury inside the lodge of the comfy couches, huge stone fireplaces (several), chandeliers and ornate bronze castings that decorate the lodge, it was a sight not seen in ski lodges. 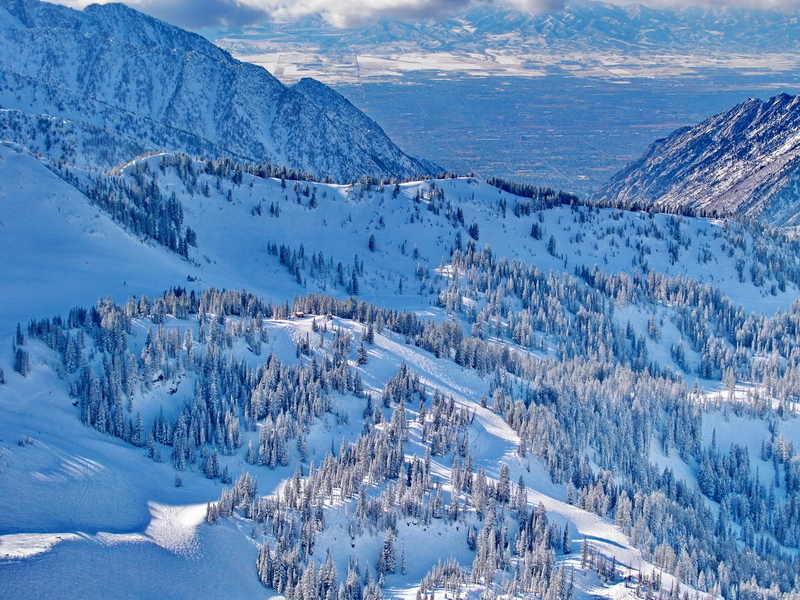 With more ski able acres then Snowbird (3000 vertical and 3000 ski able acres), it's lack of crowds as it's an hour from the Salt Lake City, and its two warm gondola's to get you up top fast, you would think that alone would be enough to make this The Resort. But on top of that impressive list is the best food I've ever had a ski hill. They have chef's working and cooked me french toast on cinnamon bread with fresh strawberries and real Vermont maple syrup, topped off with dabs of real whipped cream for breakfast, a carved roast beef, real mashed potatoes and seasonal vegetable for Robin's lunch, a fresh made stir fry with all fresh vegetables for my lunch and Wow, you sold me. Where is the on hill accommodation? I really need to come eat like that for a week while I'm skiing to burn it all off! So many of the bears went home with pictures of the marble sink bathrooms from this resort you would think none of us had ever seen luxury, but it wasn't the luxury, it was the luxury in this setting. What a combo. One more picture to explain the views from this wonderful mountain, well worth the hour north drive to go to if you are out in Salt Lake City. Below you see fellow ski bears Matt and Lily, along with Robin and myself , above the clouds, snapped by a friendly passer by. You have to see this resort to believe it. The skiing is tops, the terrain is tops, and the snow was terrific. Go now, check it out. 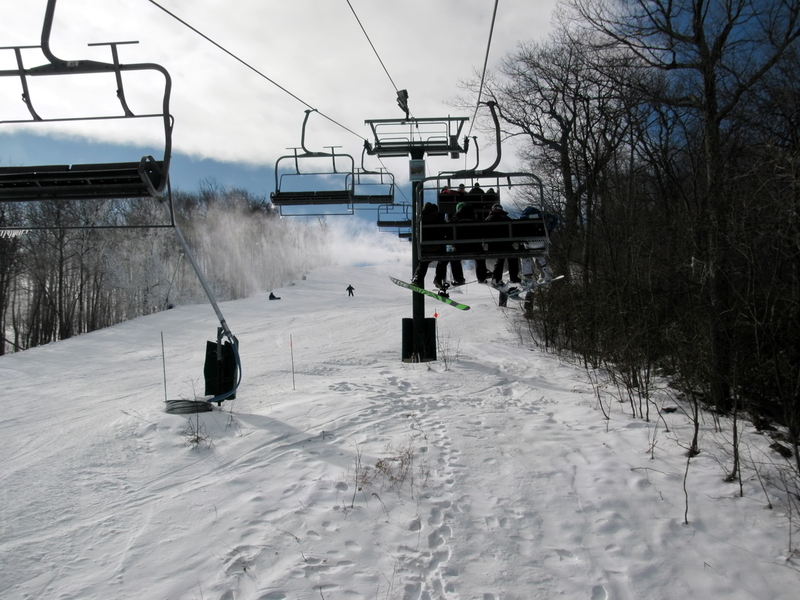 Wintergreen Ski Resort, Virginia - Have You Given it a Try? Well who new Virginia had such scenery? 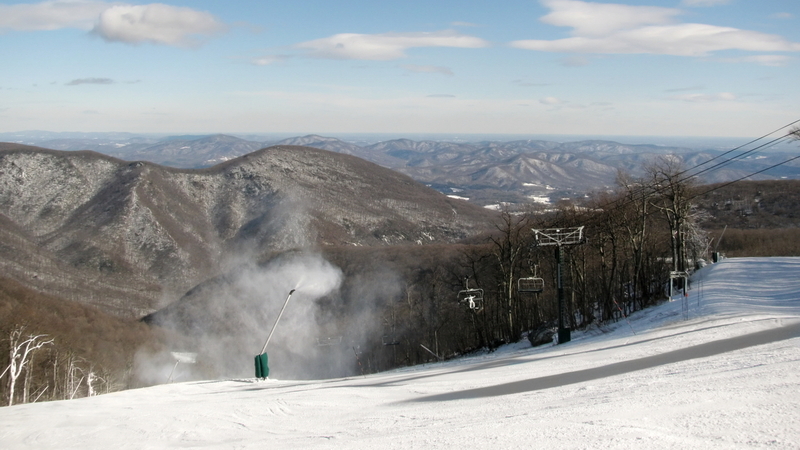 In the middle of those rolling hills is the tiny ski resort of Wintergreen. 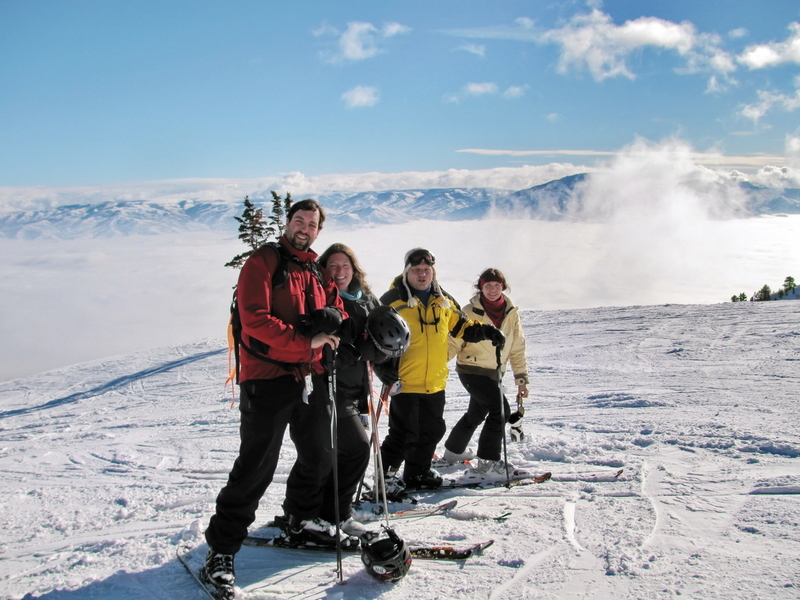 11,000 acres, 126 ski able, and 1003' of vertical skiing, is sitting at the top of the Highlands mountains, with a mini town built that includes all the necessities you could require. There's a general store with a gas station, where the gas is reasonably priced but the food is a little steep. You may want to bring your own food along and just use the store for pick up items forgotten or not convenient to bring to the hill. The big mountain flair of a warm up hut half way down the mountain isn't missed here either! 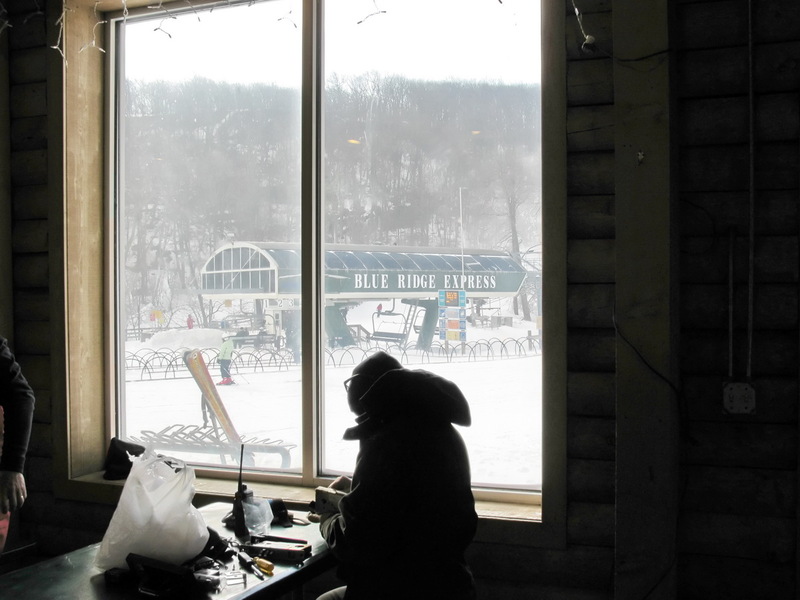 How nice to find a cozy hut to enjoy a hot chocolate at the bottom of the terrain park/easy run lift. 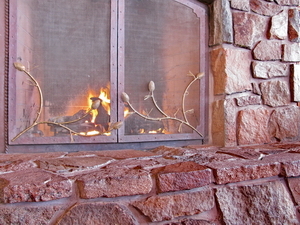 A great spot for a hot tasty soup or grilled burger for lunch too. There's also plenty of restaurants at the hill to choose from in many price ranges, and the usual ski hill cafeteria with an area to enjoy your own brought lunch also. On hill accommodation is the order of the day. There is tons of reasonably price condos of all sizes, slope side. Robin and I managed to reserve, at last minute, a slope side studio condo. This accommodation can be had for $69.00 per person/per night midweek and includes one day's lift ticket. This was true ski in, ski out accommodation, which included a fridge, two burner stove with oven, dishwasher and all the amenities to stay slope side, make a coffee and cook a candle light dinner for two if desired. 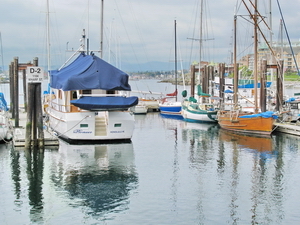 Condos are available slope side in studios to 3 bedrooms, all at very reasonable rates. We chose to head out and enjoy the Greek theme restaurant, The Copper Mine Bistro for dinner, as we were only there for a night. I enjoyed the Salmon Puttanesca (salmon and asparagus), along with the restaurant's very unusual bruschetta (made with portabella mushrooms, gorgonzola brulée and prosciutto, tomato's on the side), as an appetizer. It was really tasty, but you have to be a mushroom lover as they didn't shirk on the portabella. Robin enjoyed the bean and barley soup, which looked yummy, and the Braised Beef Short Ribs, recommended by the waitress. 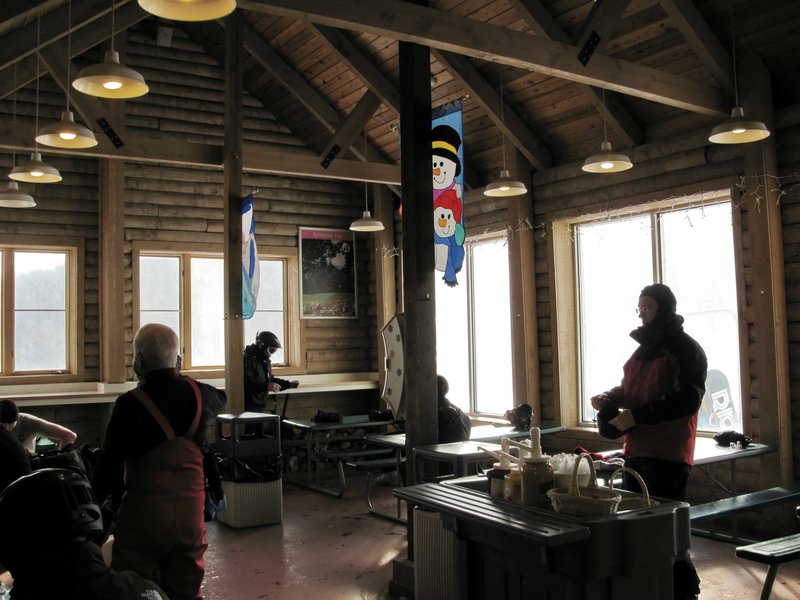 The food was very adequate for the top of a remote ski hill, my asparagus was made from fresh, not frozen, but it wasn't over the top to rave about. It was certainly good though, just not something I'd head to hill for if I wasn't there already. All in all it was really tasty, with a nice ambiance and sits atop the hill where you can look out over the scenery if it wasn't dark. For breakfast the next morning I just had a banana I purchased at the general store the night before and then chose to have our morning coffee and lunch at the cabin (shown above in thumbnail, click for larger pictures) across from the Blueridge Express Lift. This would be the Checkerberry Cabin, found half way down the mountain at the bottom of the green (easy) Dobbie run or Diamond Hill (terrain park and easy run). A hot bowl of chicken noodle soup and a kaiser roll was a very inexpensive lunch and Robin's burger looked positively scrumptious. It was a large burger, served on a fresh Kaiser roll, served fresh and hot off a grill not fried. The choice of dining possibilities on site was quite impressive. I originally thought we would have to head to the tiny near by town of Wintergreen to eat but there's far more on the mountain then in town and the prices were very reasonable. It was a pleasant surprise. From the cabin where we had breakfast you can head out the door and down to the expert terrain accessed by the Highlands Express Lift running up the length of the Turkey Chute run. 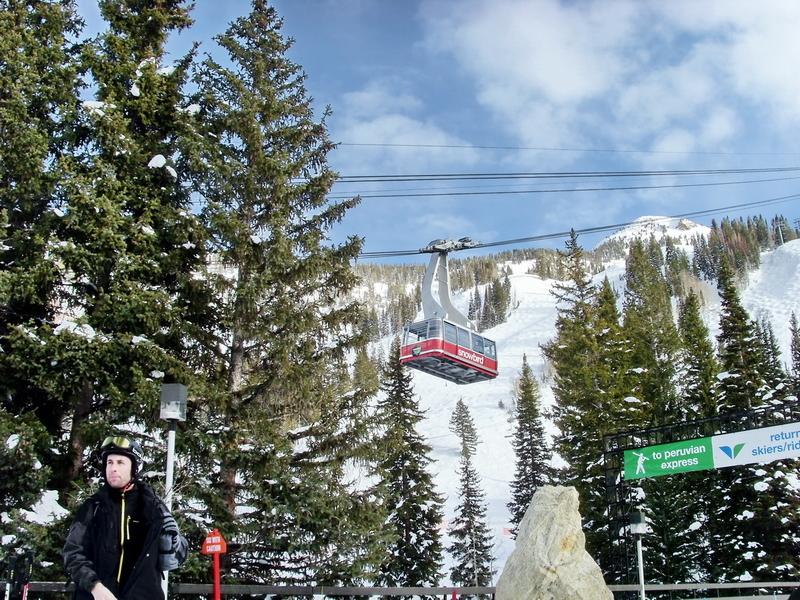 This lift gives access to expert terrain only and climbs the resorts full 1003' of vertical. The terrain is very nice, though a little icy this day, as the bit of fresh snow from the morning was blown and skied off to the edges of the runs by the afternoon. I just skied the edges! When we were here last March the Upper Wild Turkey was fully bumped but so far there's not a bump in sight. This years frigid cold making the snow so hard, the resort will keep likely keep the bumps off it for a while, rather then having hard icy bumps, or they just aren't forming as the snow is so too icy due to the cold. The cold should subside this week and we should get back to more normal area temperatures according to the forecast. We have been only reaching our usual lows (just above freezing) as our daily highs. 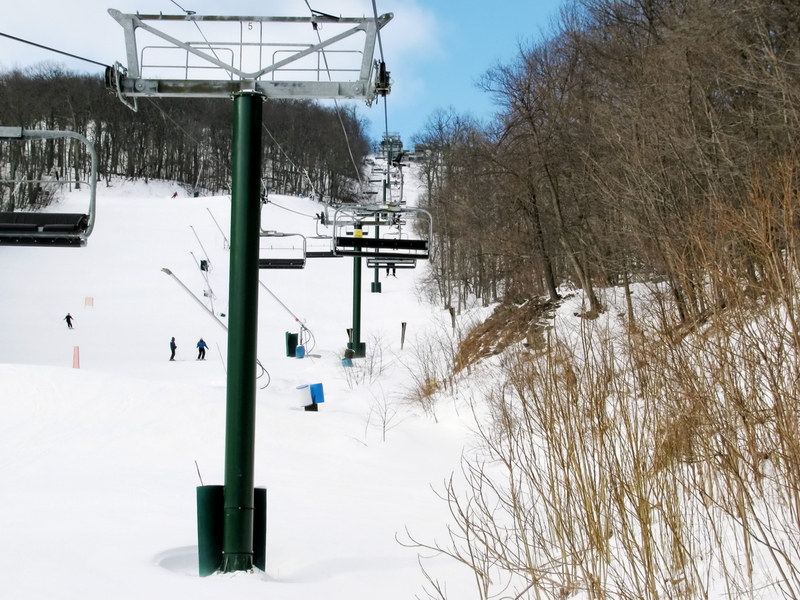 From the top of this lift you can access Upper Wild Turkey, Outer Limits or Upper Cliffhanger. Robin is standing just off to the right of the Highland Express Lift at the top. Great scenery from here too. On side note, the one marked double diamond, lower cliffhanger, really doesn't encompass what I would typically call double diamond terrain. It would need to have trees or bumps for me to find it even approaching a double diamond status. So if you are an expert skier and see no bumps on it, it's a pretty tame well pitched cruiser. 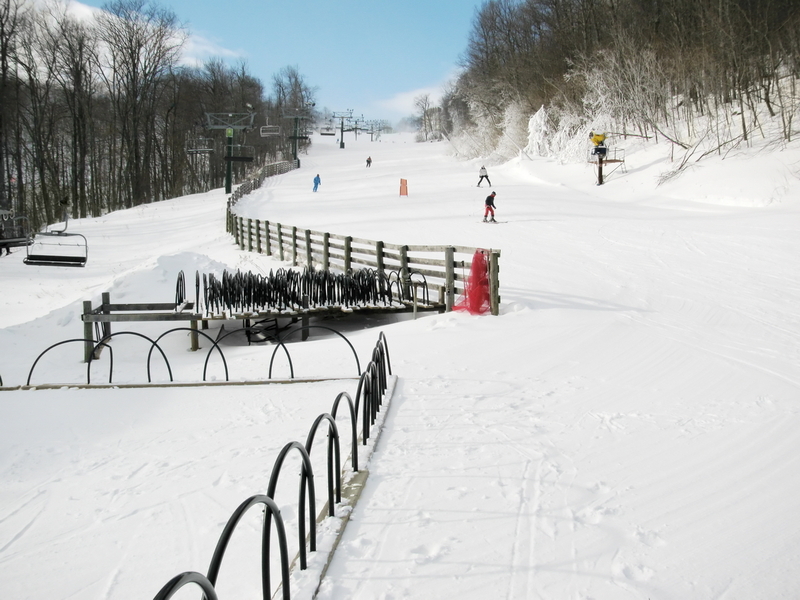 More expert terrain and the majority of intermediate terrain the resort has to offer can be found on the far east side of the mountain off the Big Acorn lift, running up the Big Acorn run. 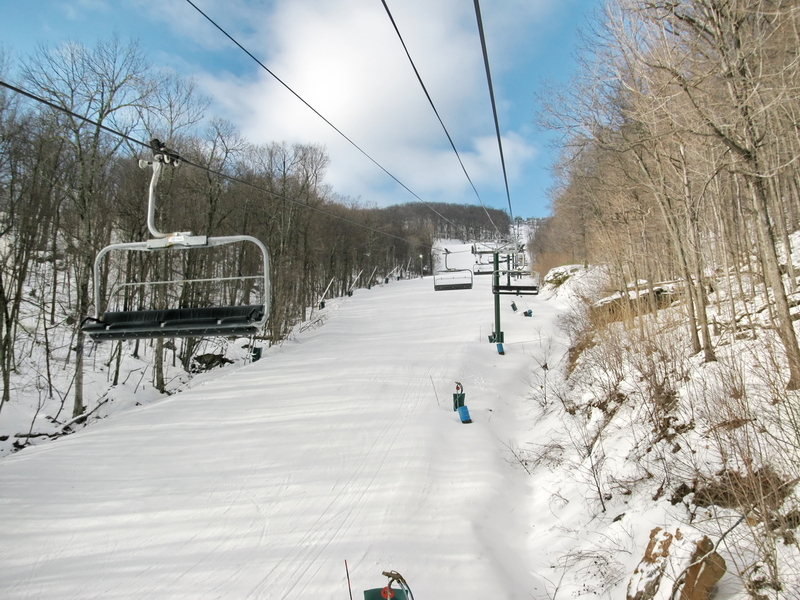 Though this lift only accesses 525' of vertical it had the best snow of the resort and great consistent pitch to ski on. I had a lot of fun over here but Robin found it way too cold as the snow guns were blasting all the runs as you skied and the wind was trying to blow you back up hill as you skied down. I thought the nice snow was worth the discomfort but we did just a few runs before heading back over to the Highland Express. Don't be concerned by the shorter vertical of these runs, they are well worth skiing. Don't miss this portion out of fear it's too short. Also, this is where the night skiing is open, and again, the terrain is really very nice though on the shorter side. 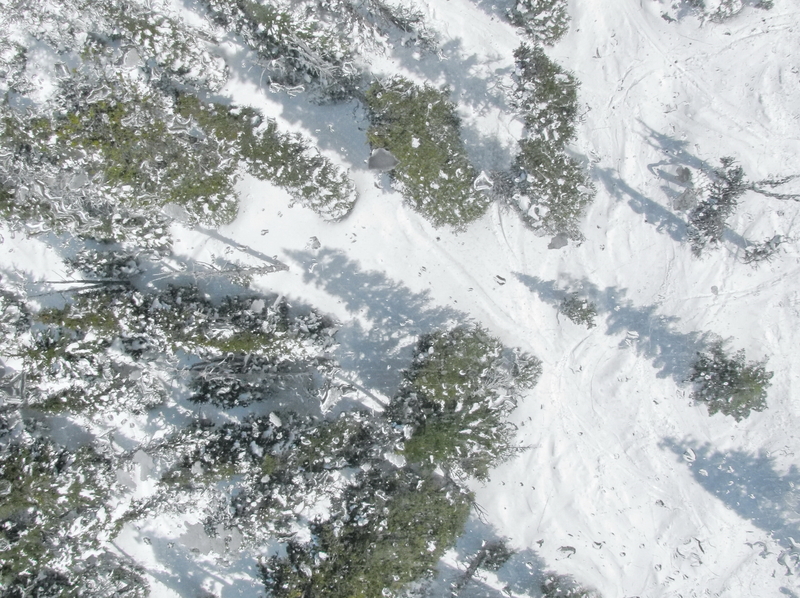 See all the pictures from above of terrain and scenery below here; just click the thumbnails. 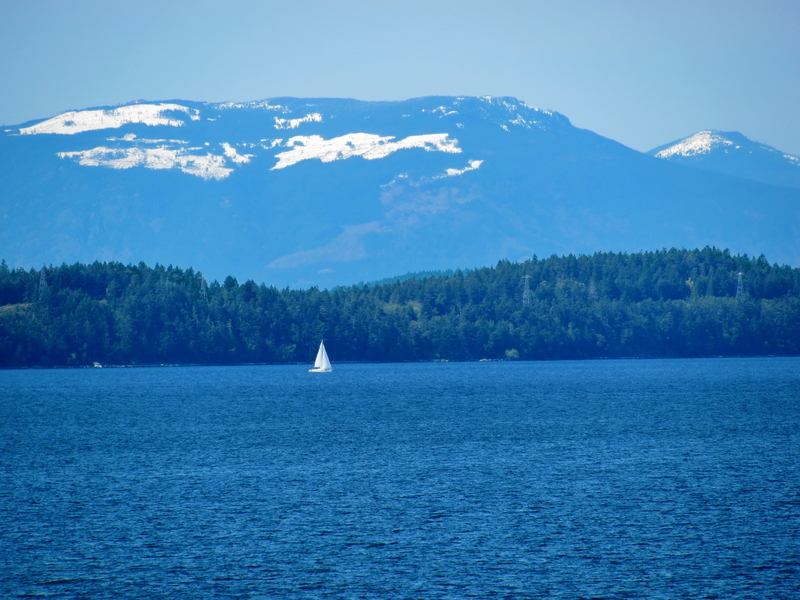 Victoria, Whistler, Whale Watching, - A terrific spring vacation, photo album here. 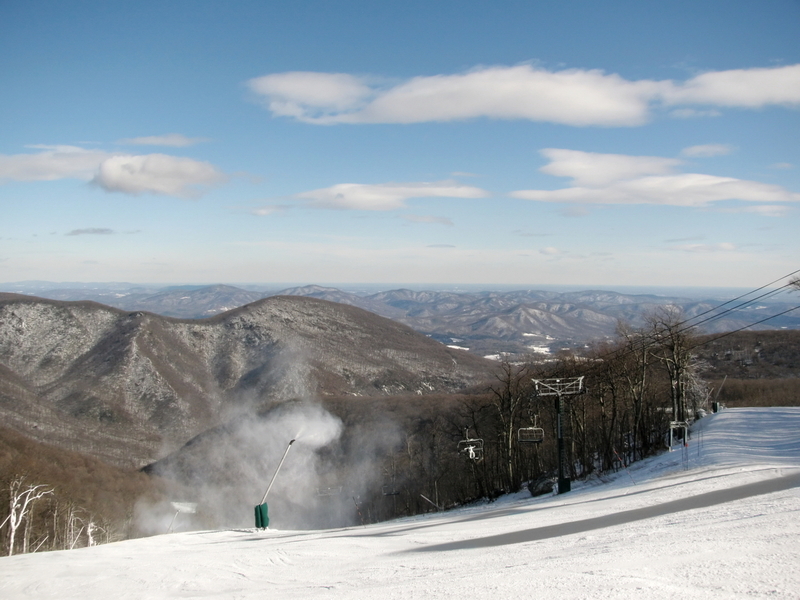 Skied Wintergreen Yet?- 2.5 hours north of Raleigh, NC, nestled in the Virginia Hills. 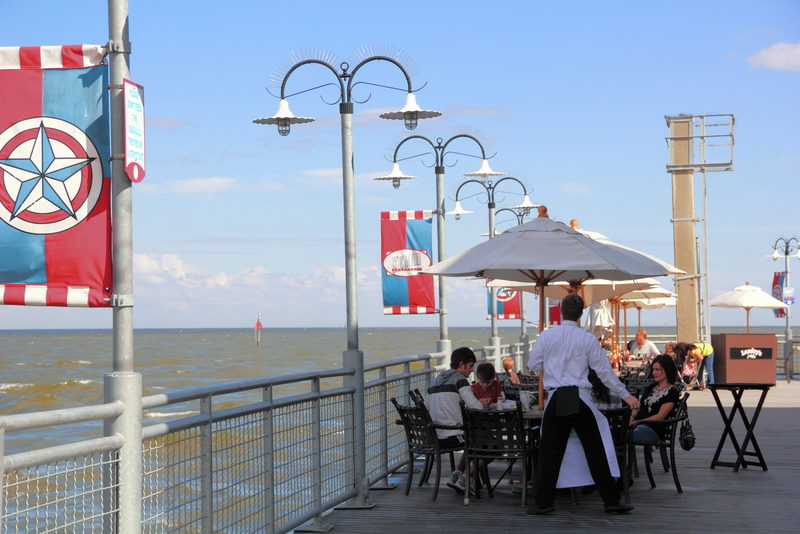 What about the Norfolk Area -Favorite places to eat in Virginia Beach, Chesapeake and what to see. Atlantic City, Long Weekend -Why we keep going back. Where to eat, sleep and play. 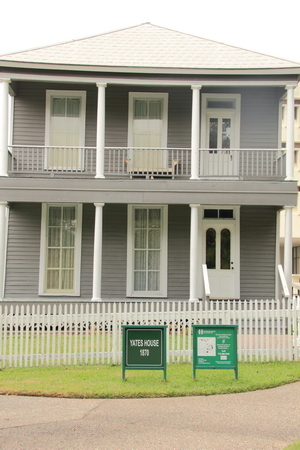 Four Days in New Orleans - Fours days free in New Orleans was a great time. It's on the list for a week's vacation now, with so much to see and do. 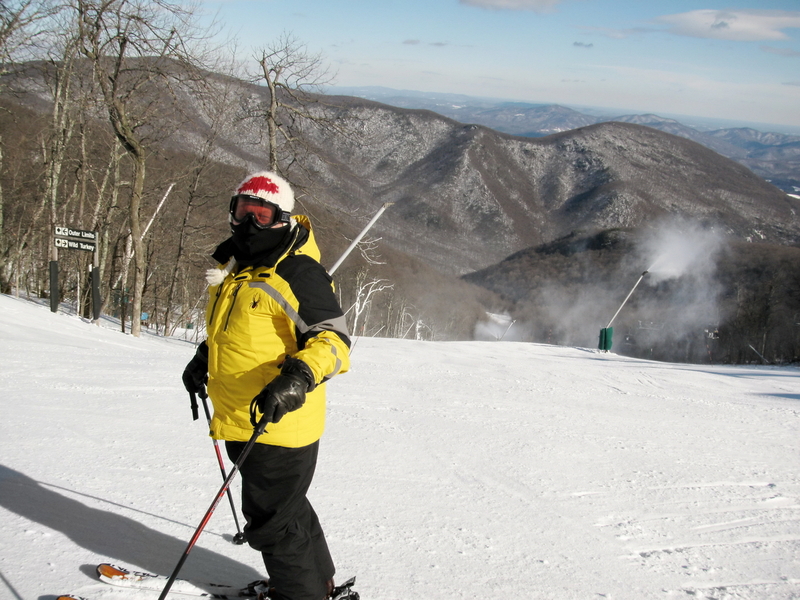 Skiing In North Carolina -Yes, there really is skiing here! See pictures, links to hill sites and more. Click to read.